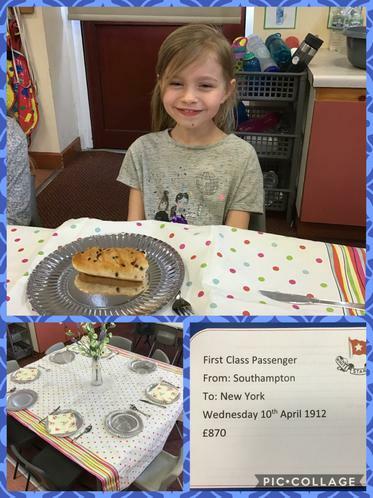 Lady Duff Gordon was one of the passengers aboard the Titanic on the night it hit the iceberg. 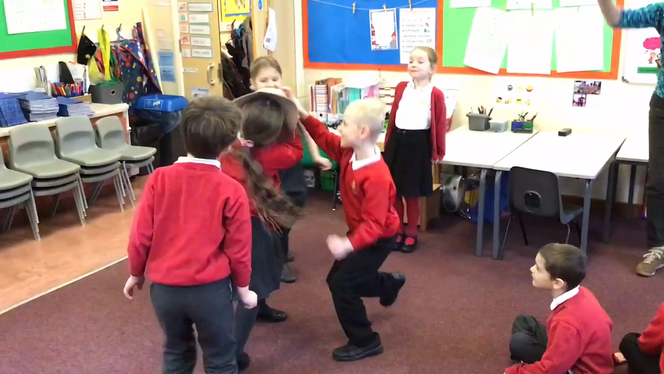 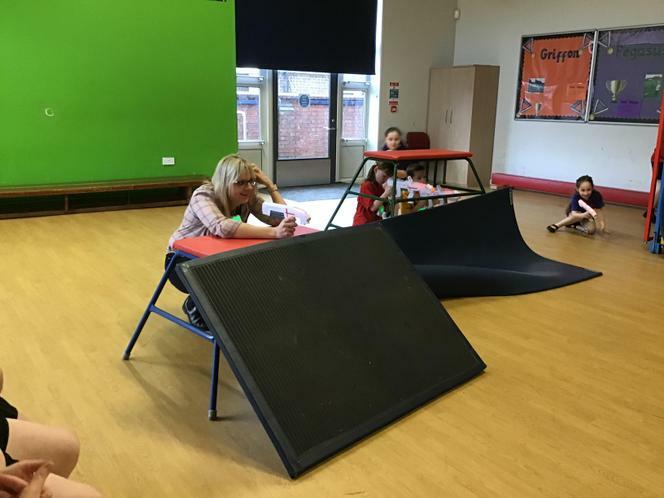 She was lucky enough to survive the disaster and today the children first of all watched her recount below and then acted it out. 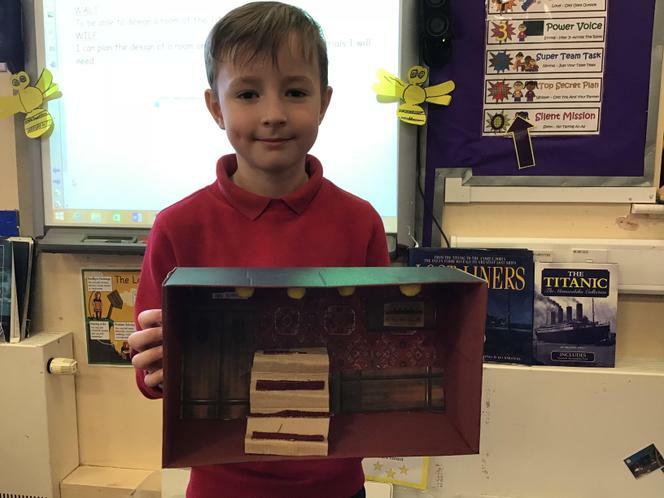 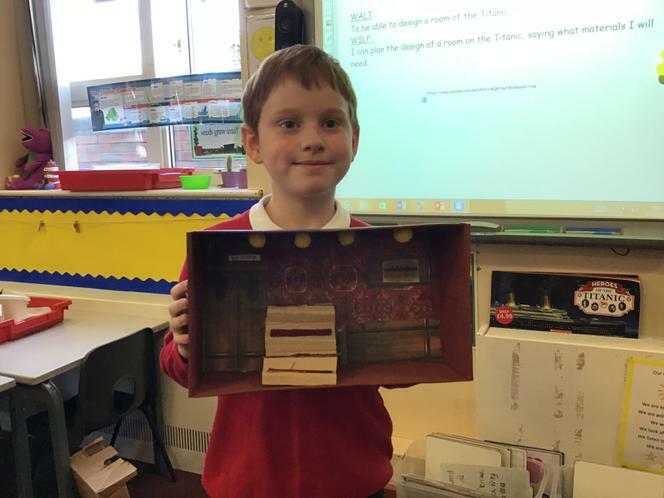 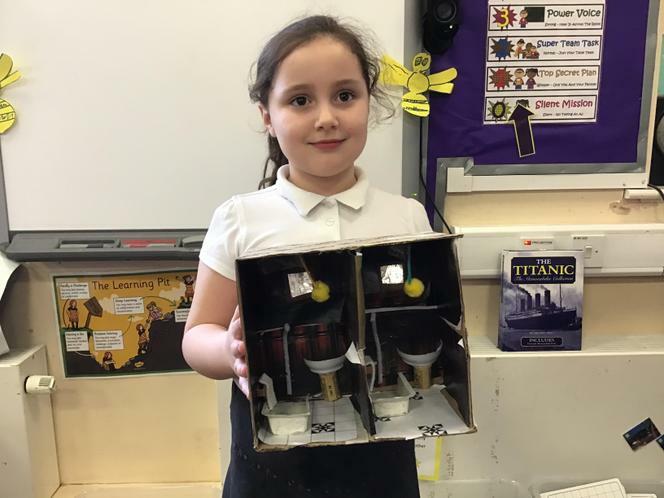 We spent the week looking at the individual rooms in each class on the Titanic. 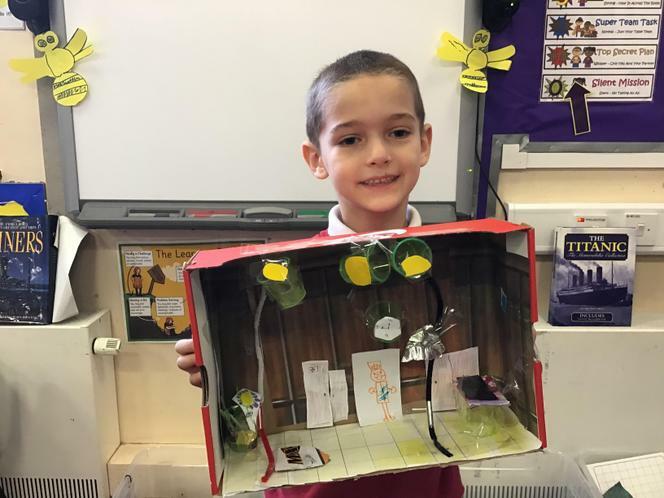 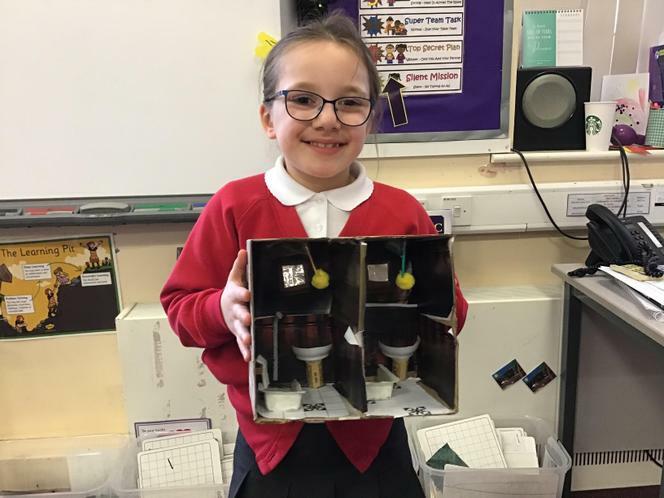 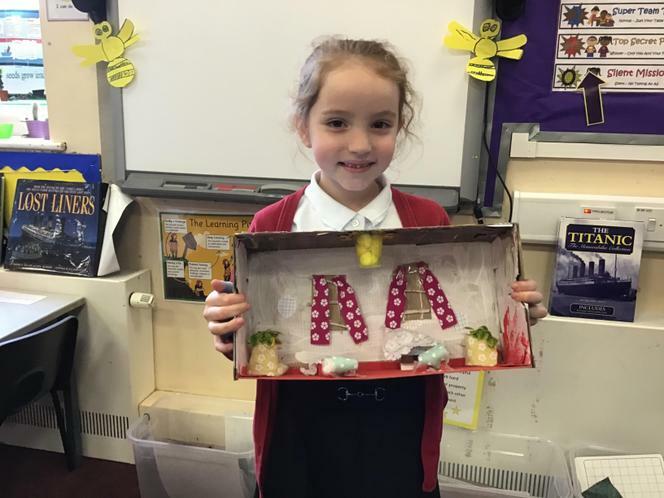 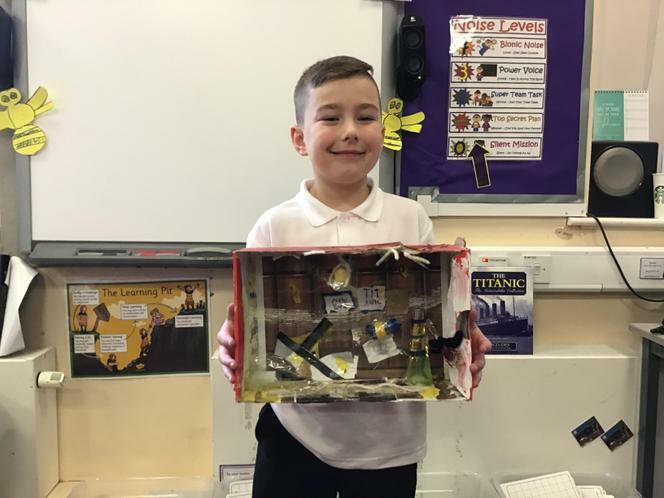 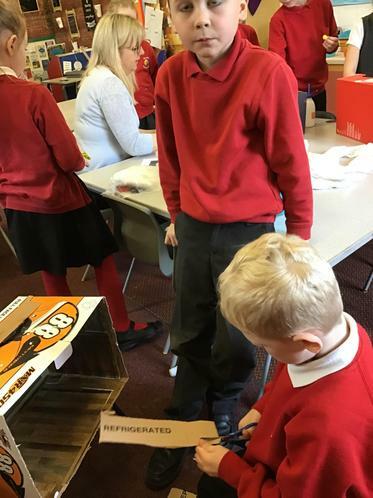 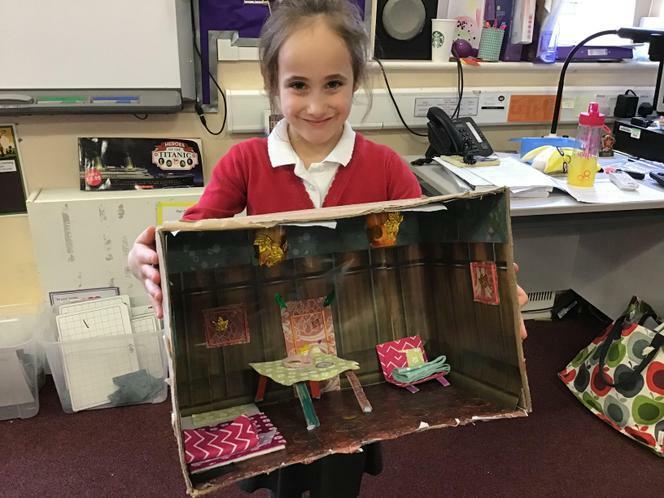 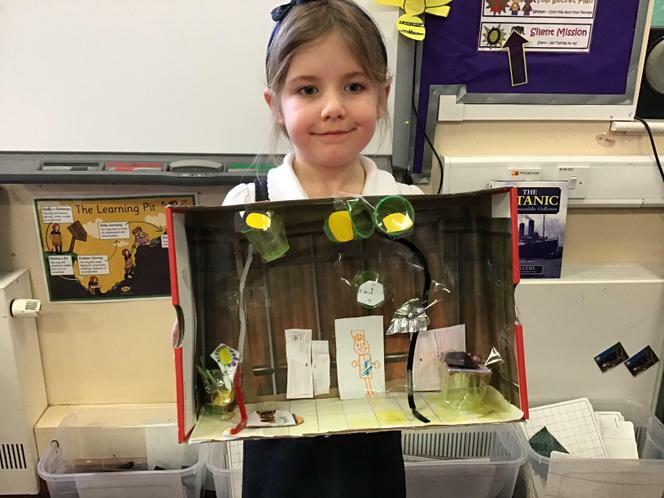 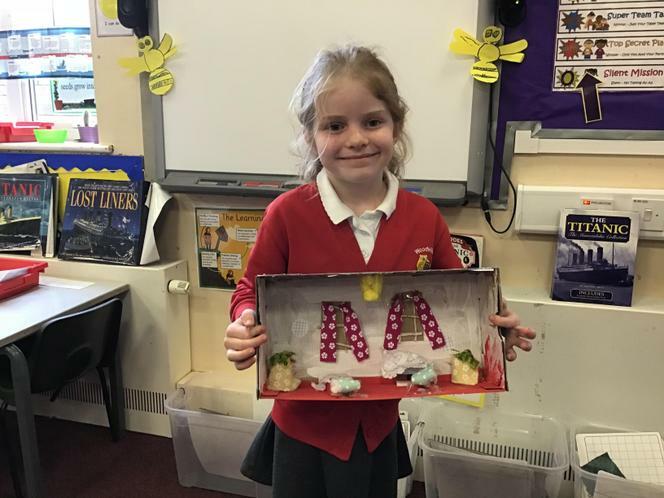 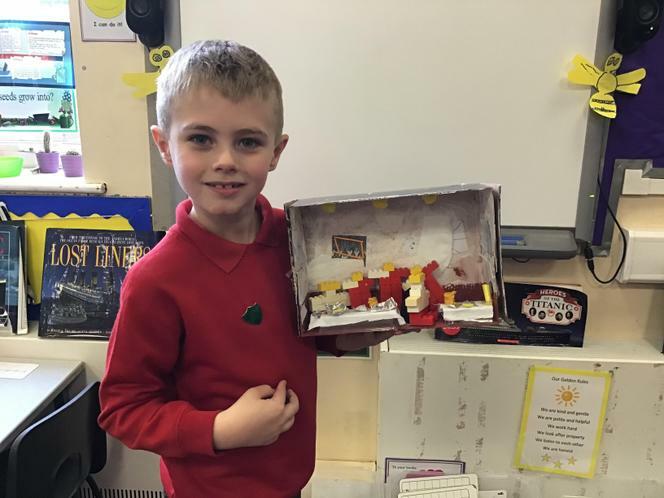 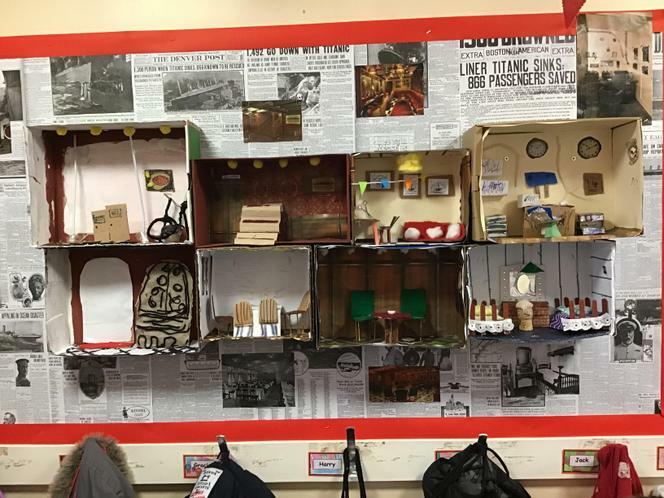 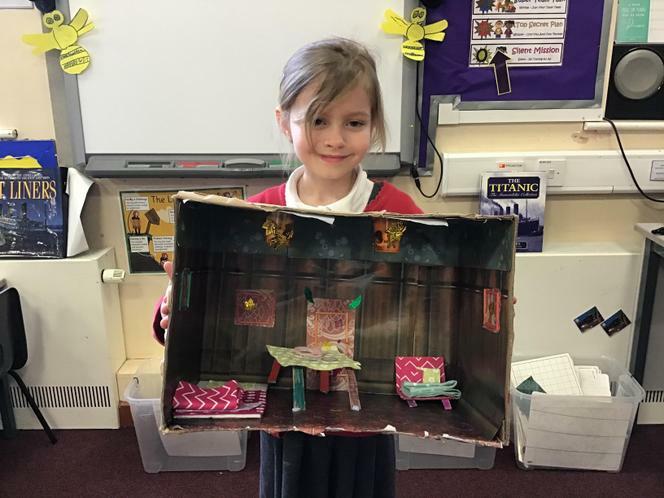 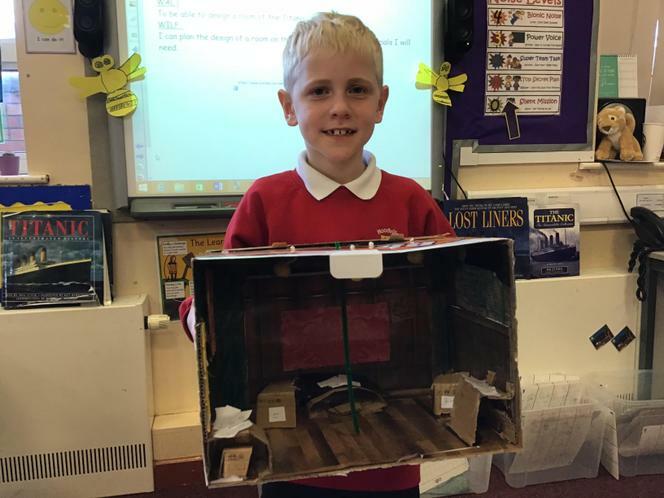 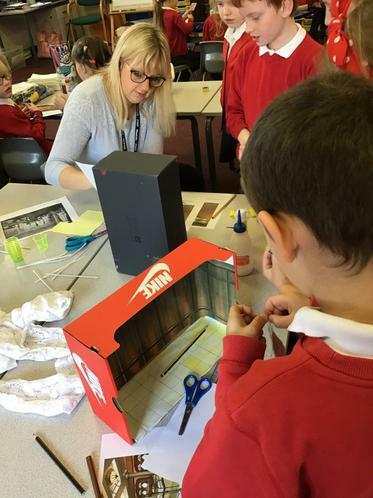 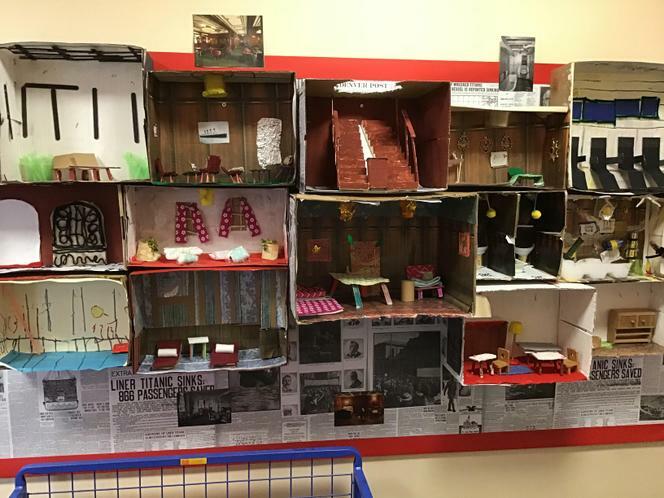 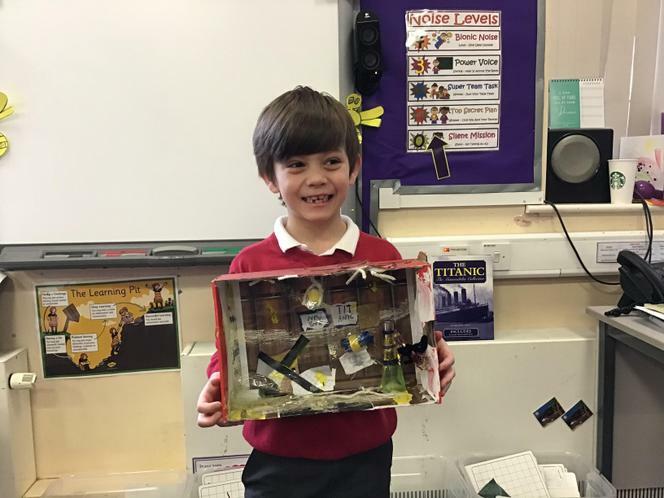 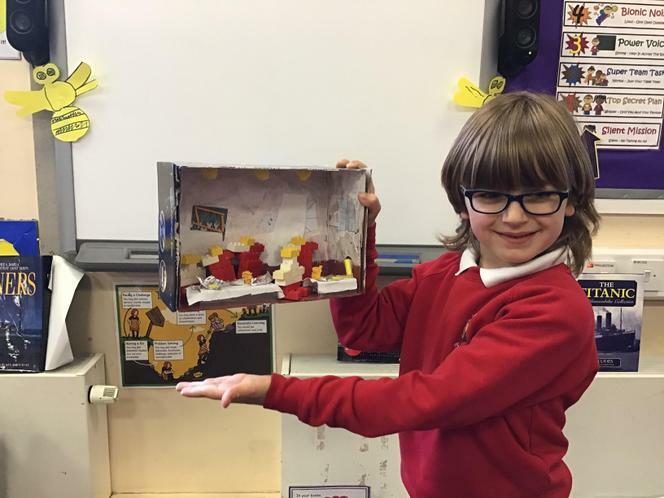 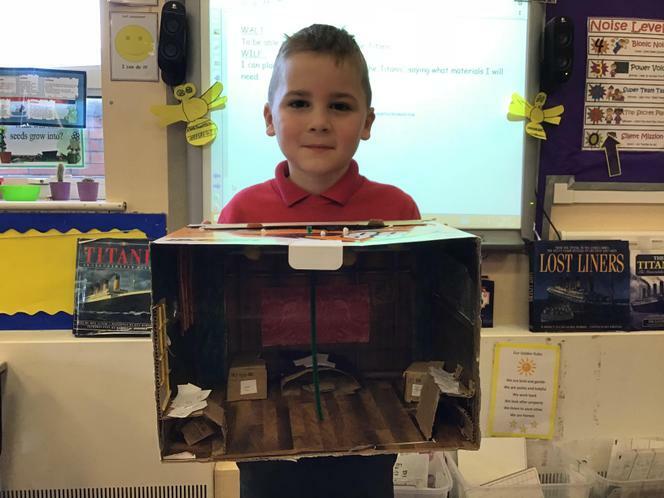 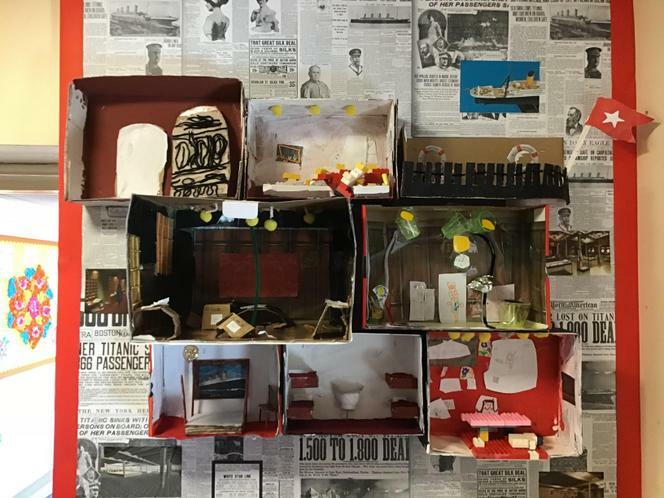 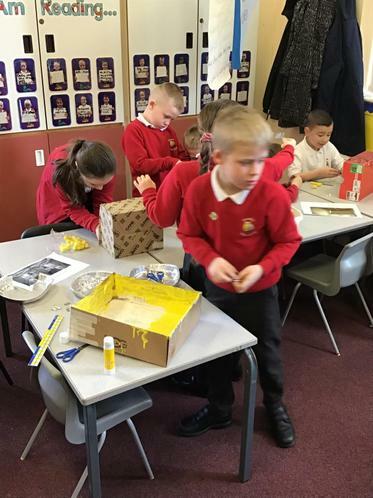 We then recreated them using shoe boxes and lots of different materials. 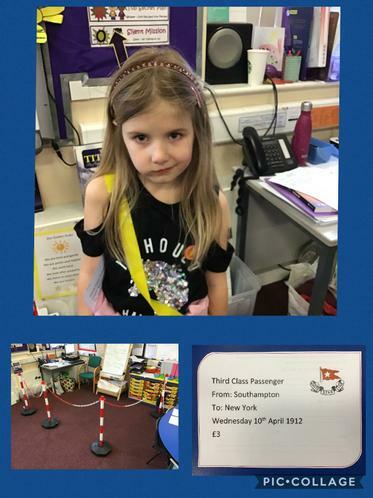 They are now on display in the Year 2 corridor and look fabulous. 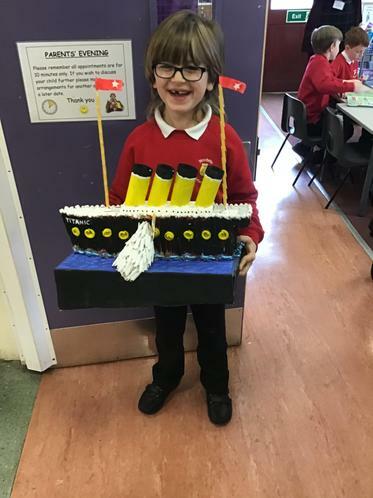 Today we set sail on the Titanic. 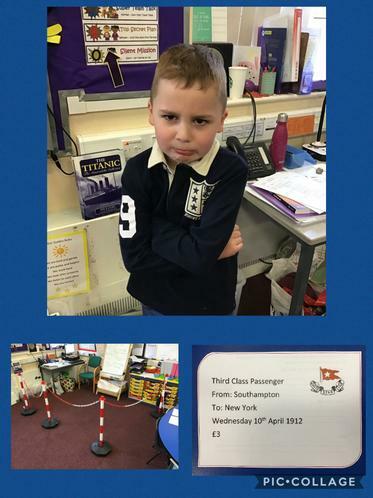 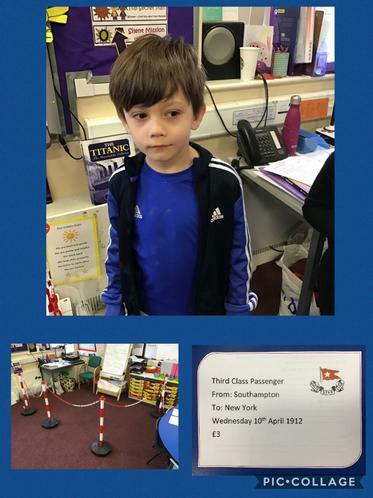 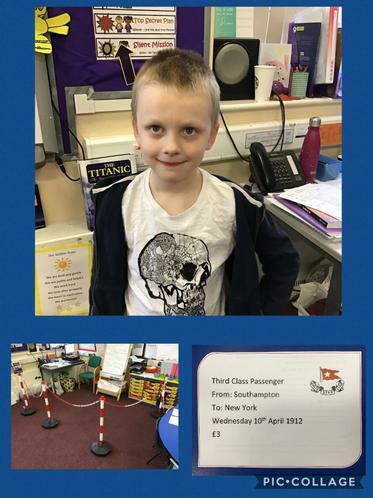 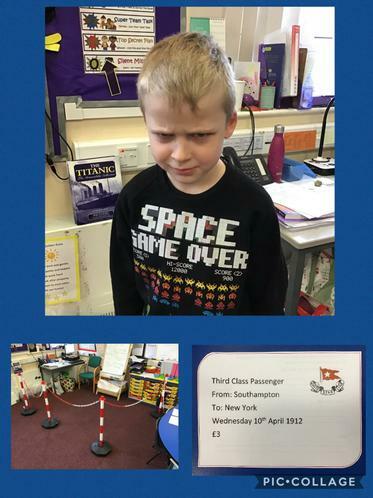 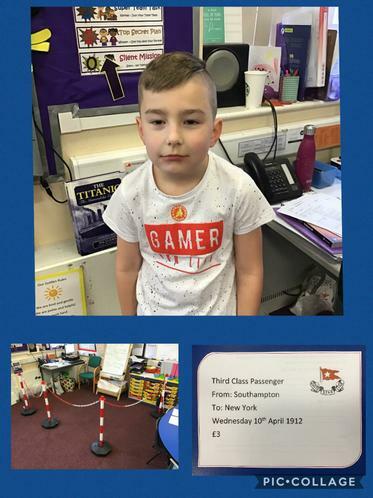 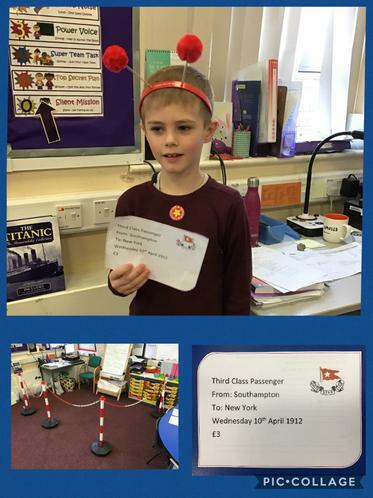 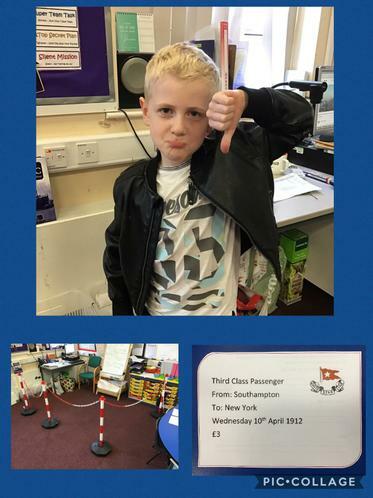 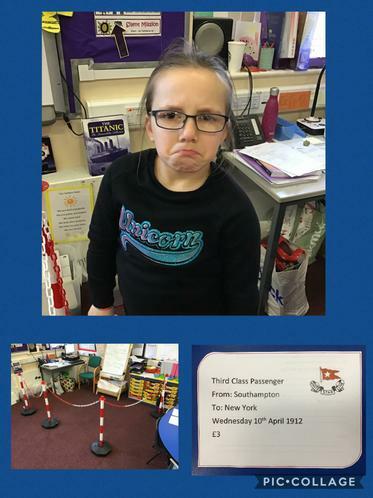 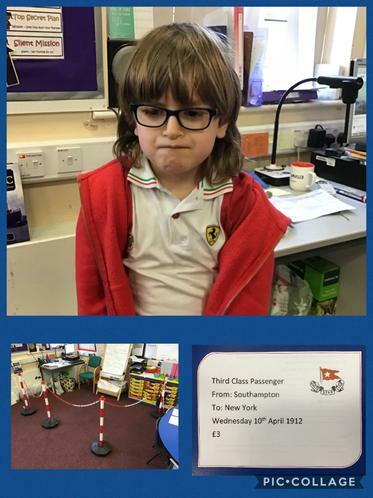 We were all issued a ticket in either 1st, 2nd or 3rd class and embarked in Southampton. 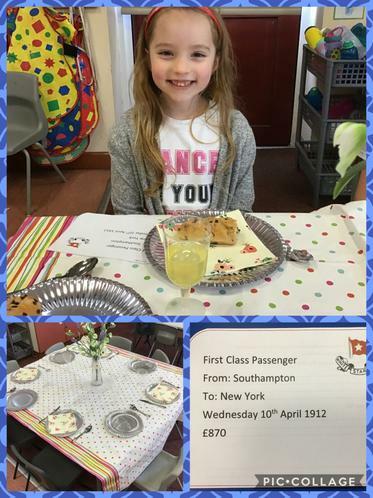 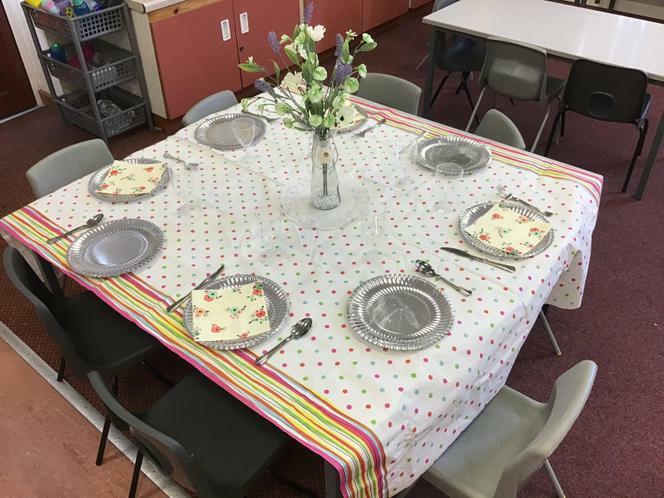 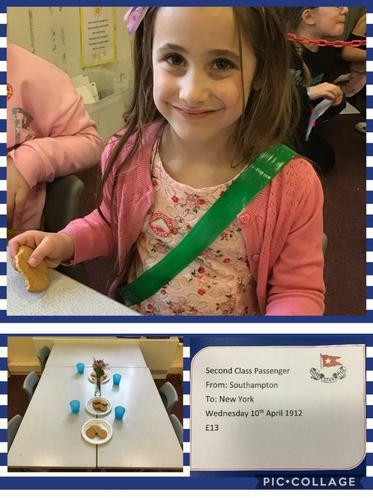 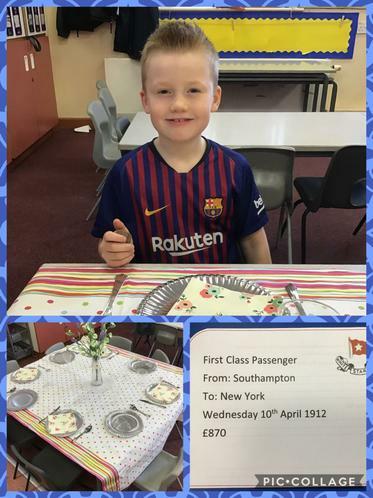 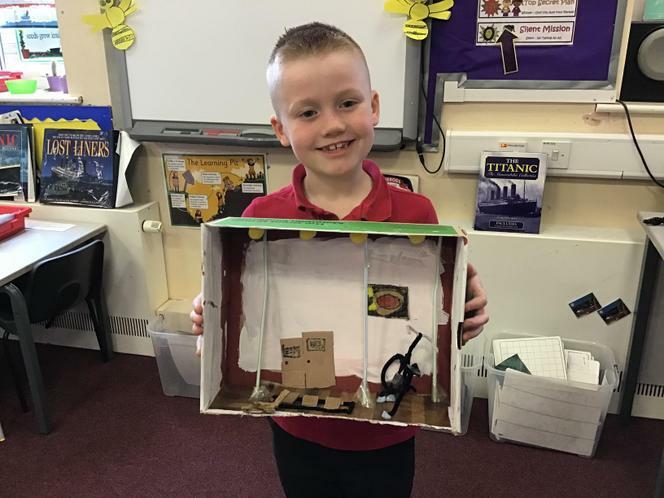 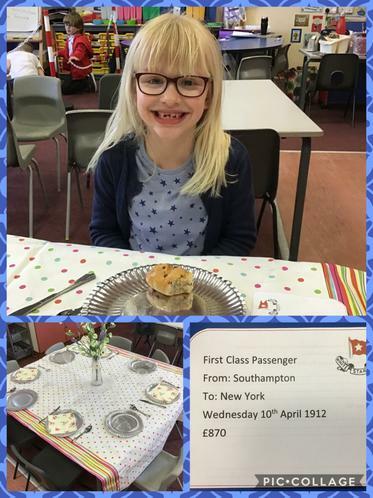 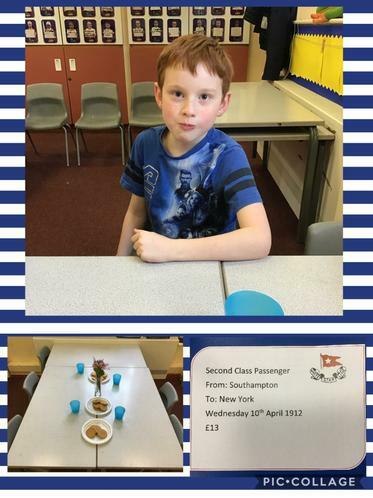 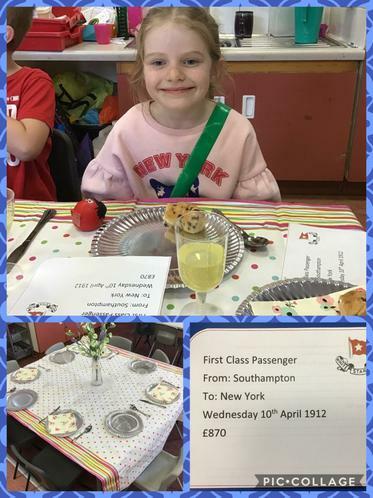 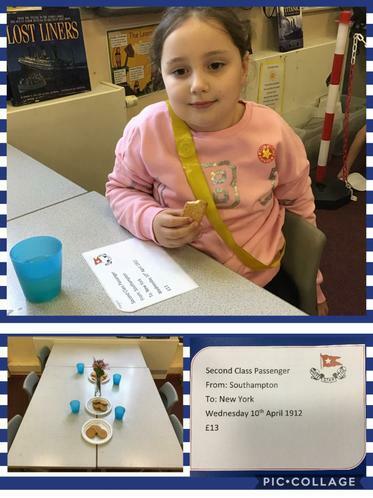 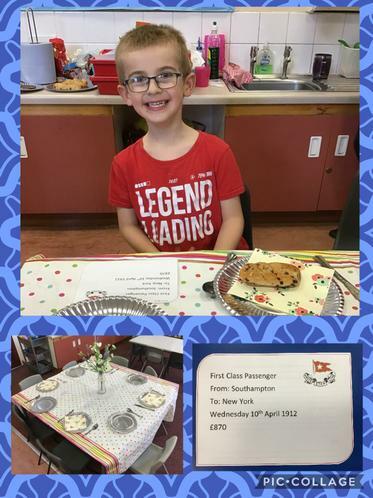 The first class passengers were treated to silver service, and had the opportunity to visit the swimming pool, Cafe Parisian, smoking room and gymnasium to name just a few. 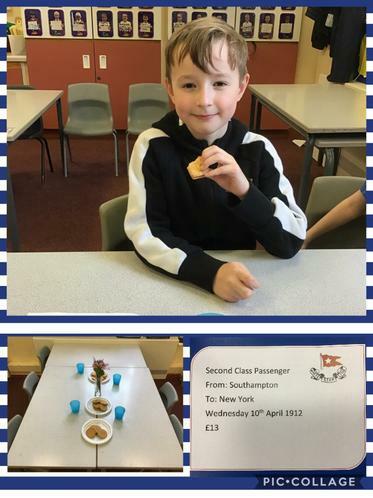 The second class were still treated well but weren’t served by top class waiters, and weren’t allowed in as many parts of the ship. 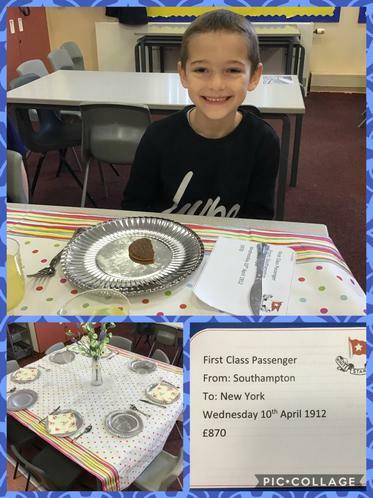 The third class passengers were put into steerage and had to fend for themselves. 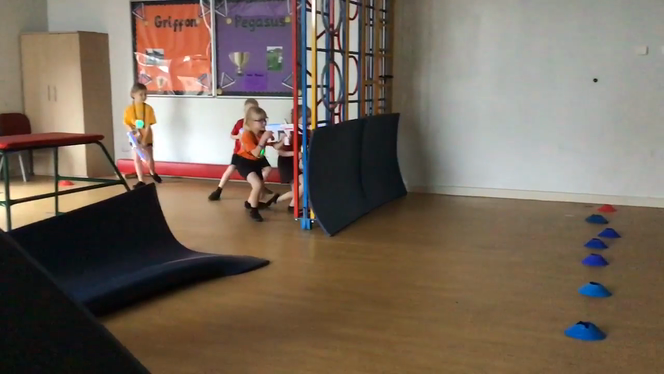 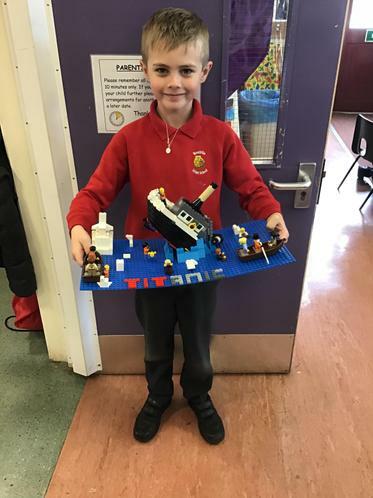 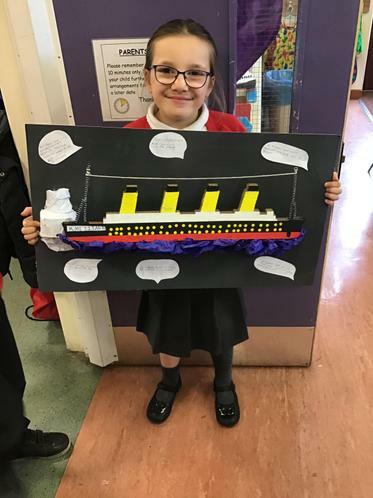 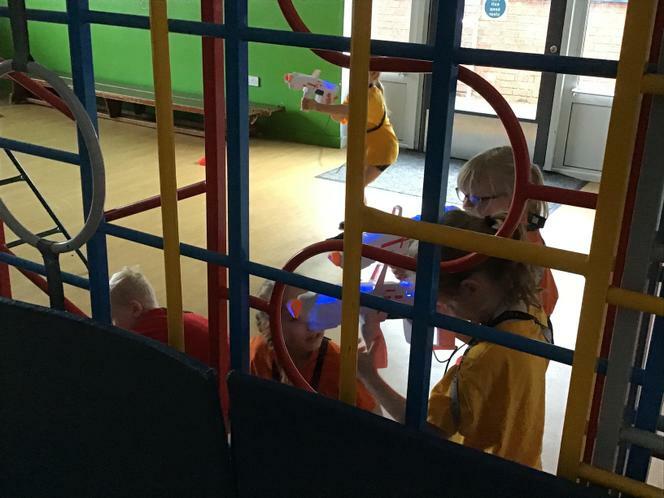 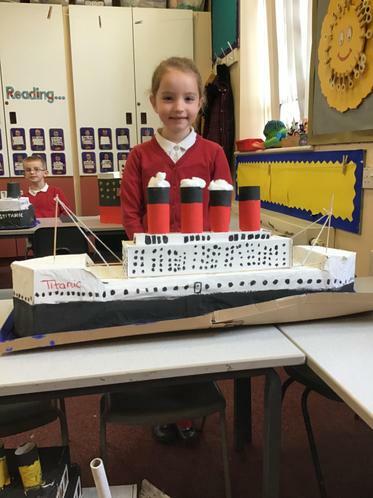 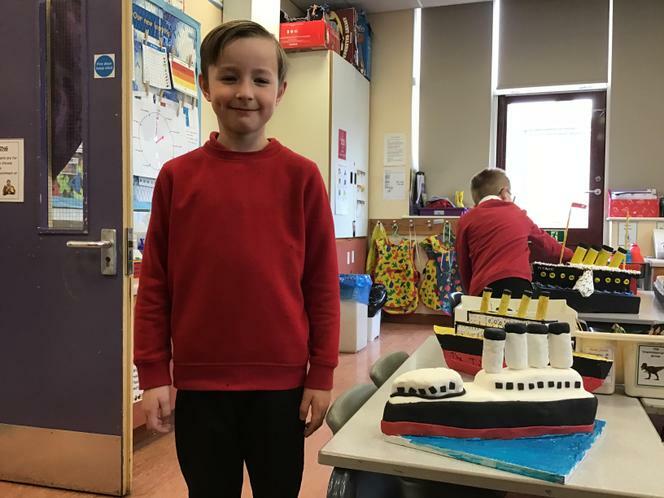 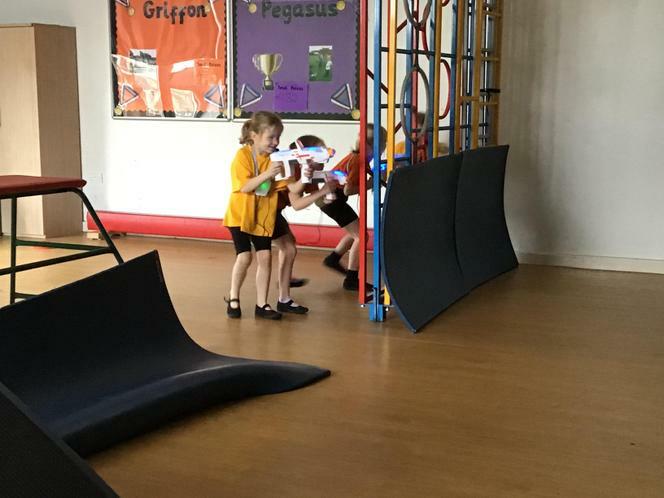 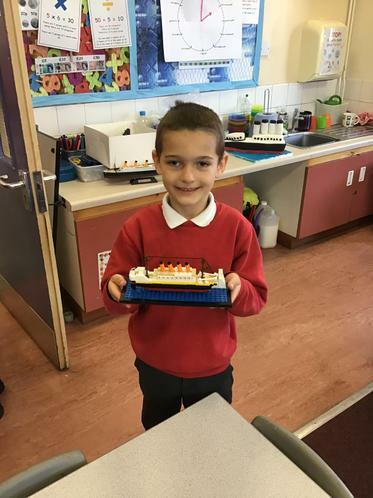 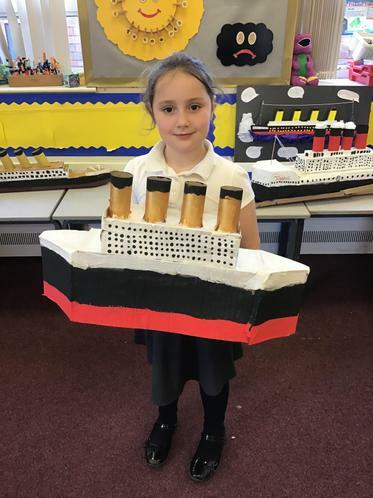 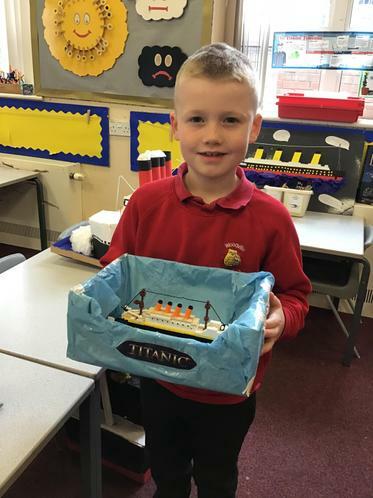 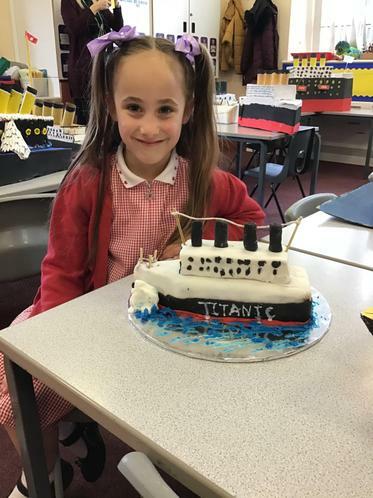 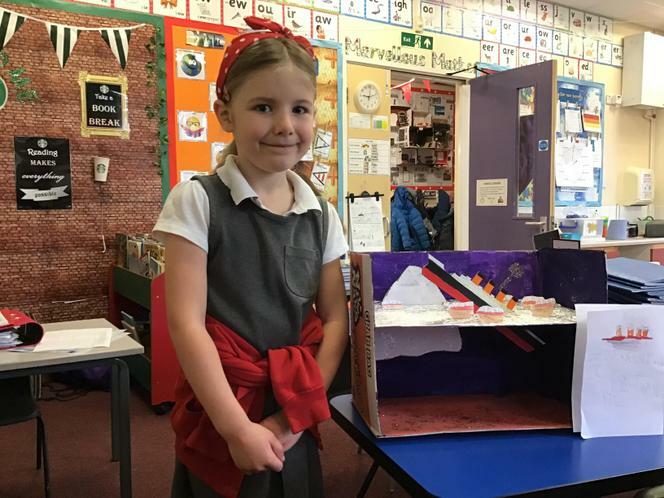 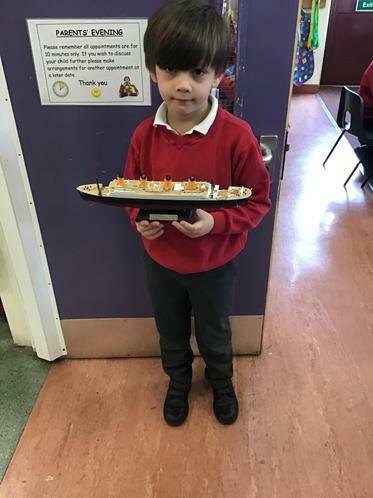 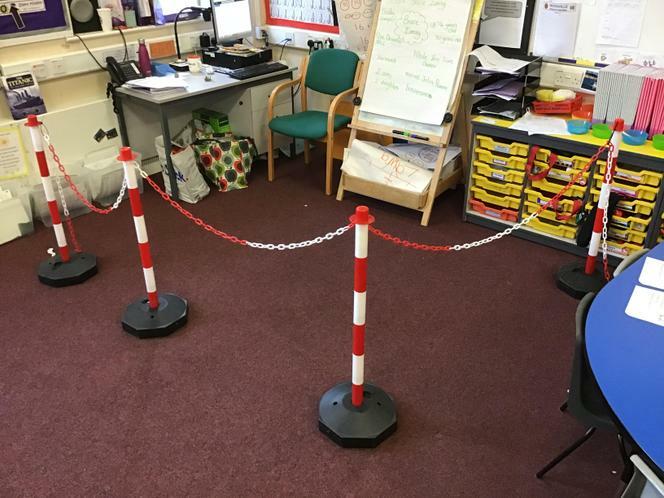 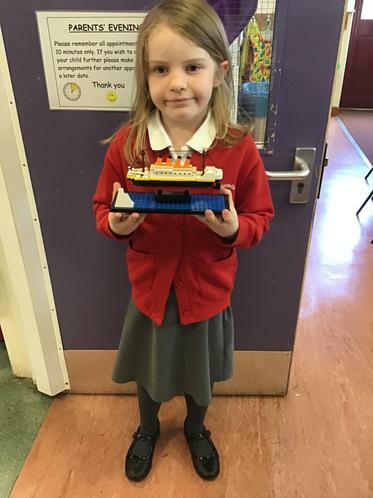 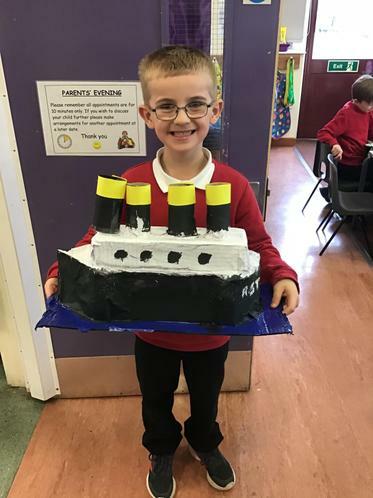 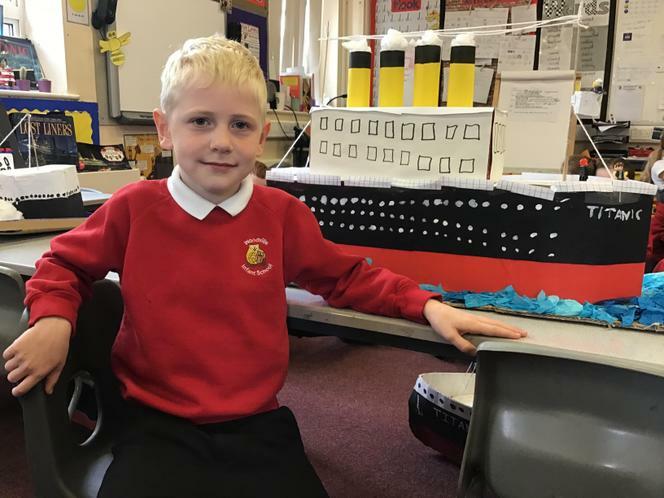 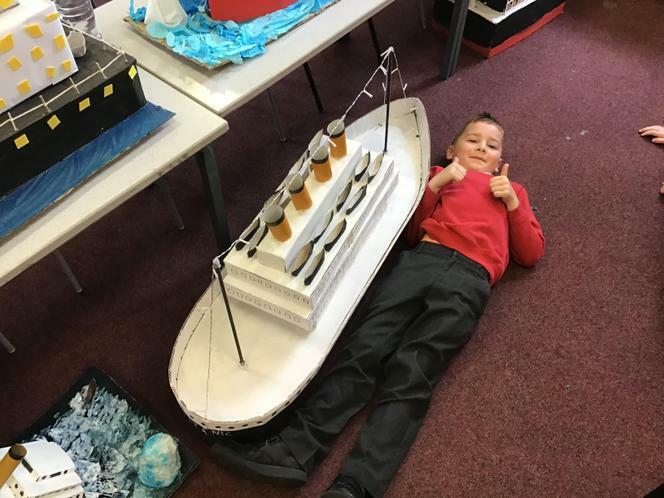 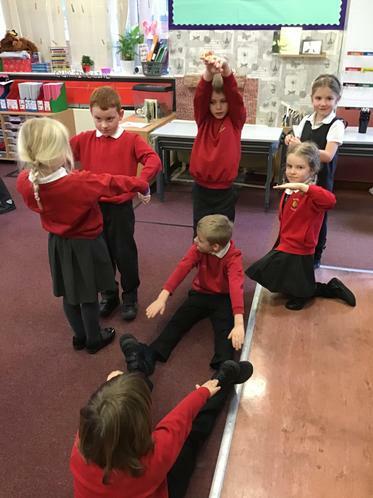 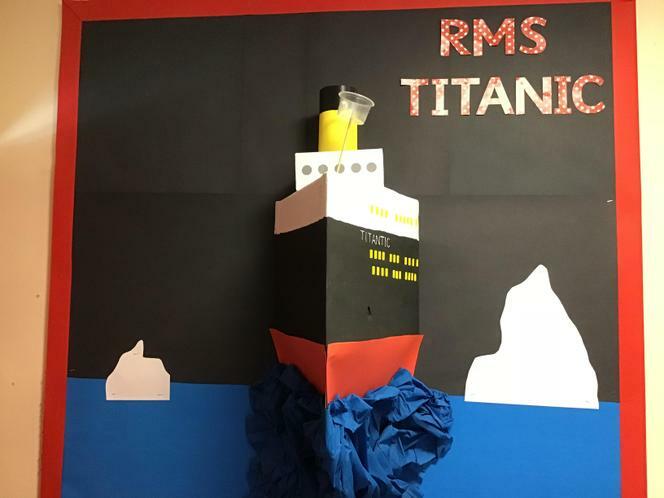 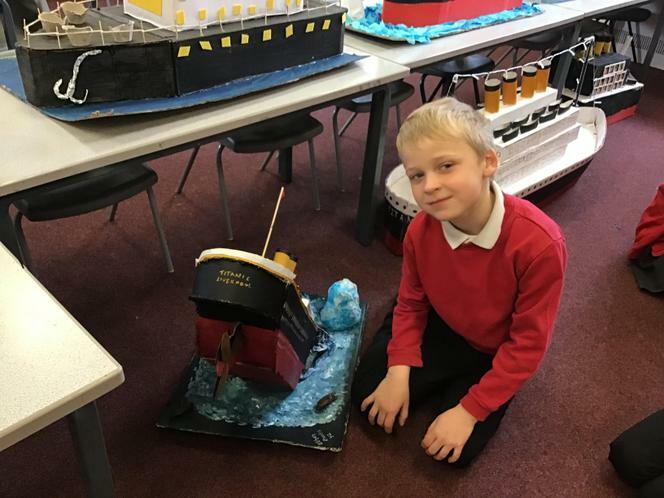 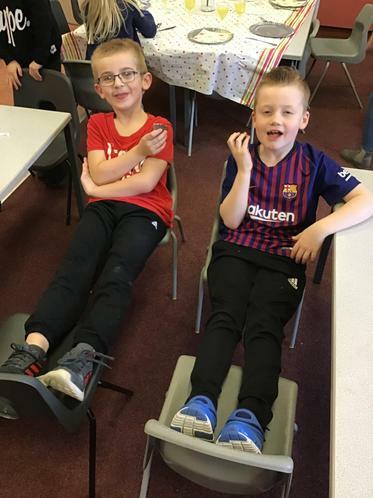 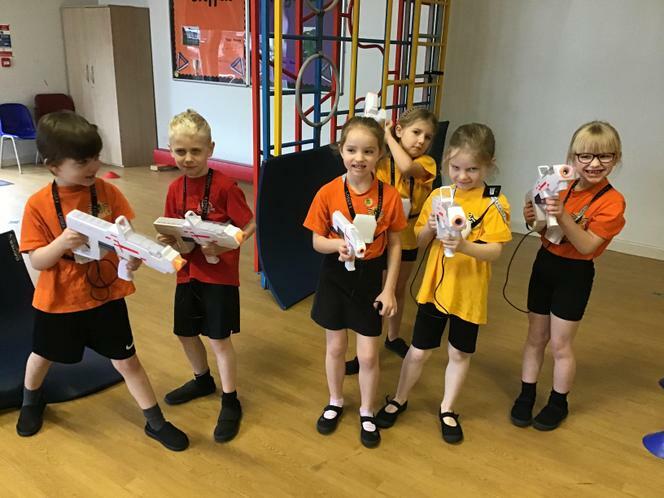 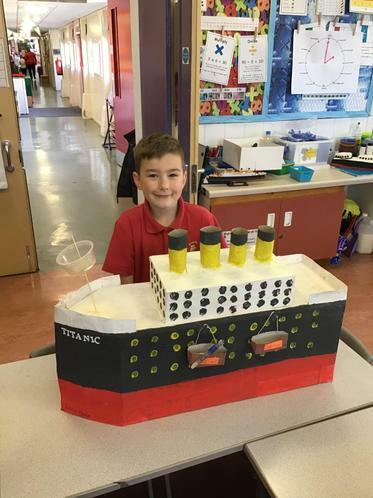 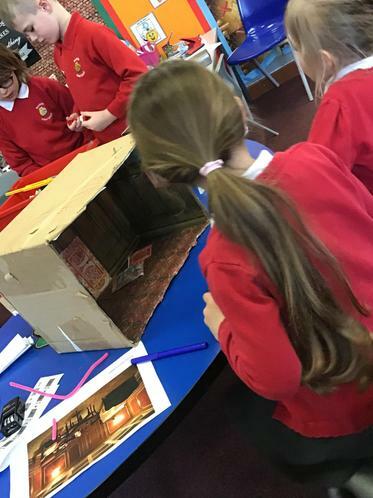 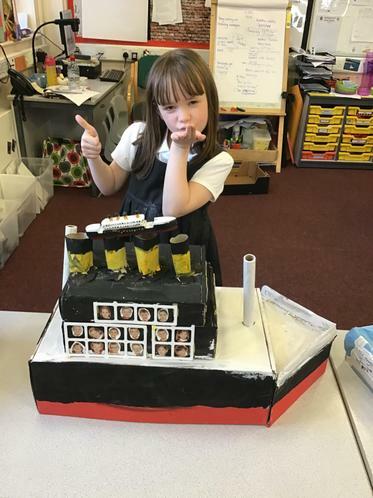 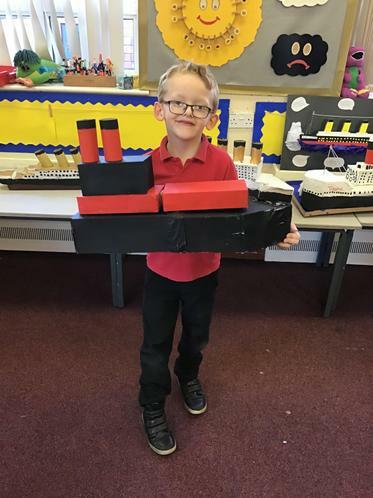 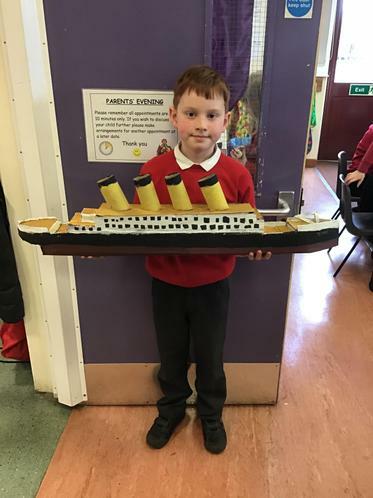 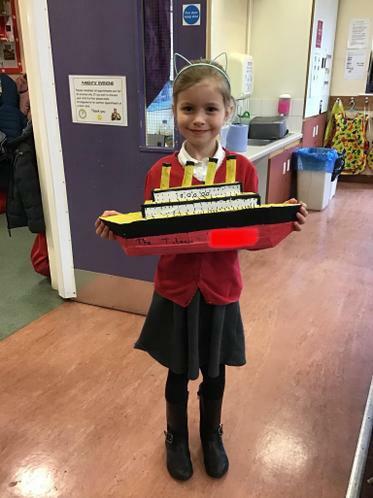 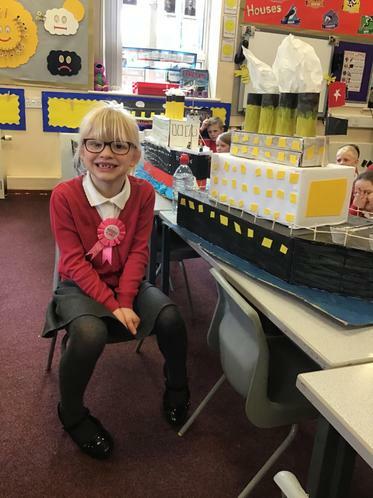 We recreated the ship, the journey and even hitting the iceberg, allowing only first class passengers and women from second class to have a place in the lifeboats. 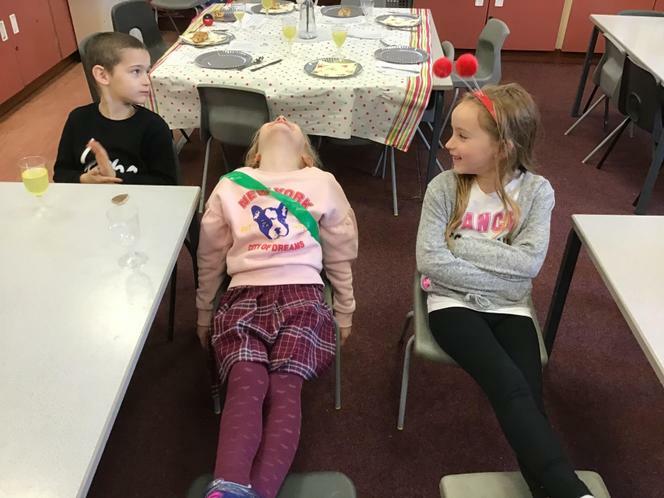 The rest, unfortunately, perished. 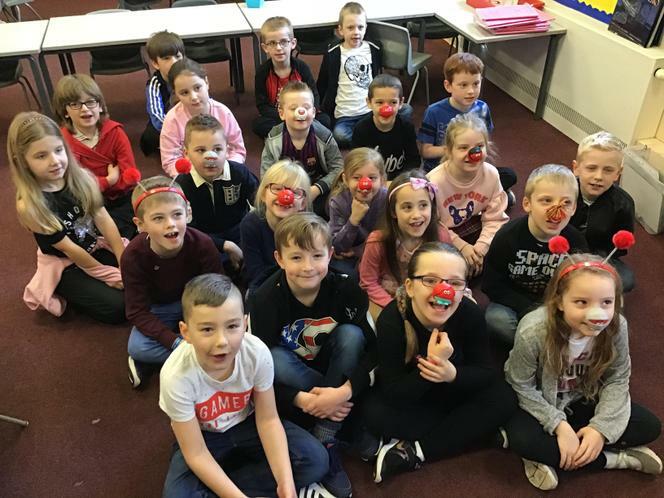 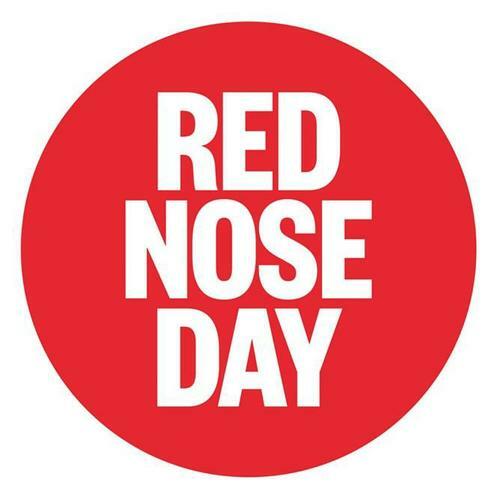 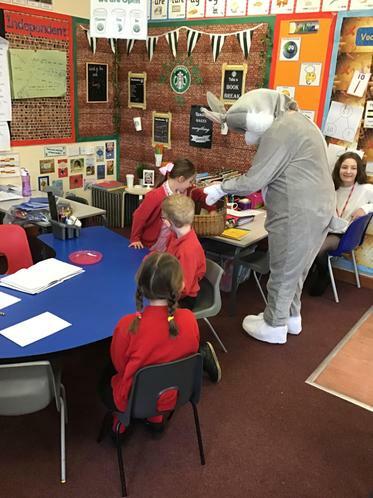 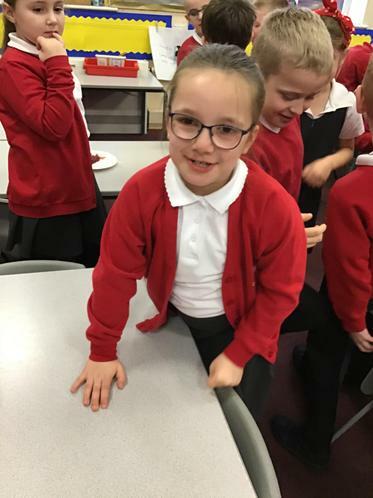 We all came to school in casual wear and donated to support Comic Relief. 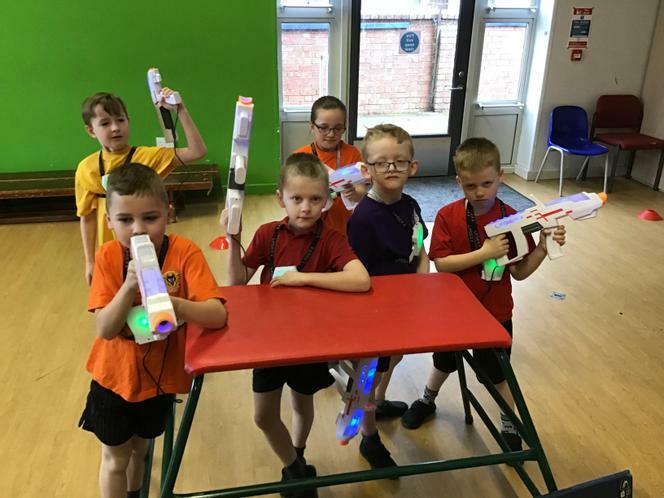 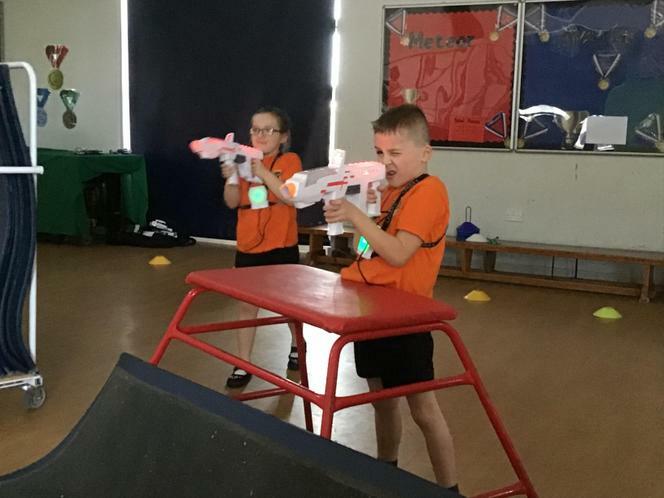 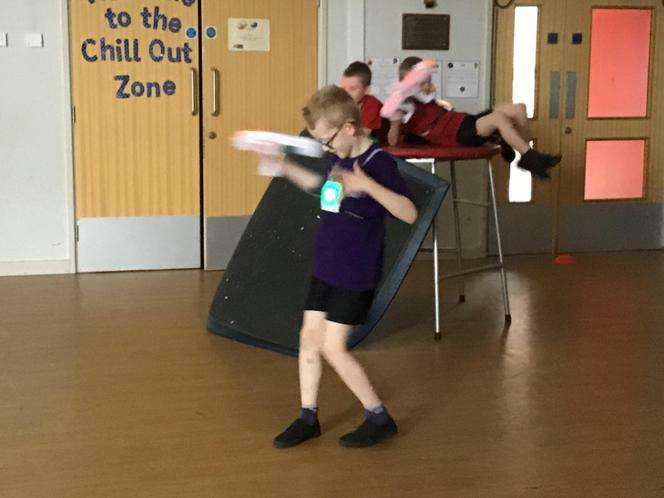 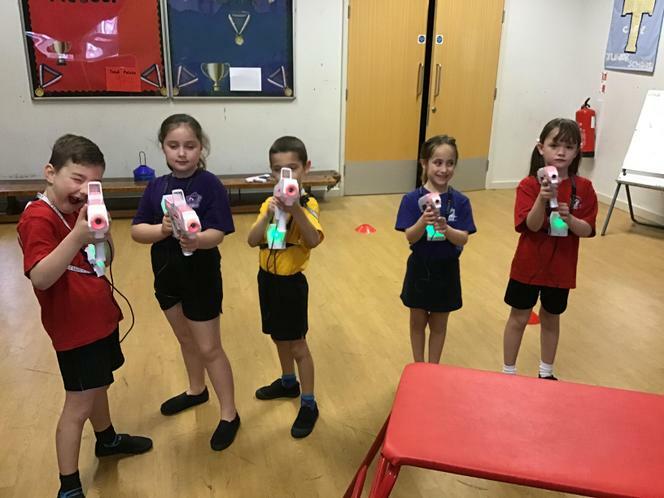 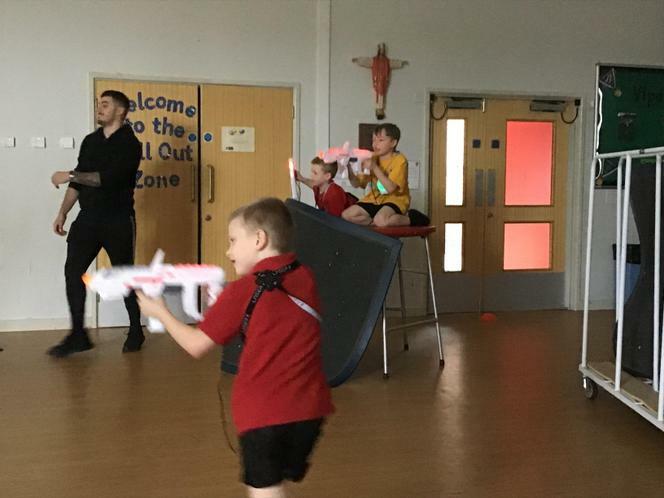 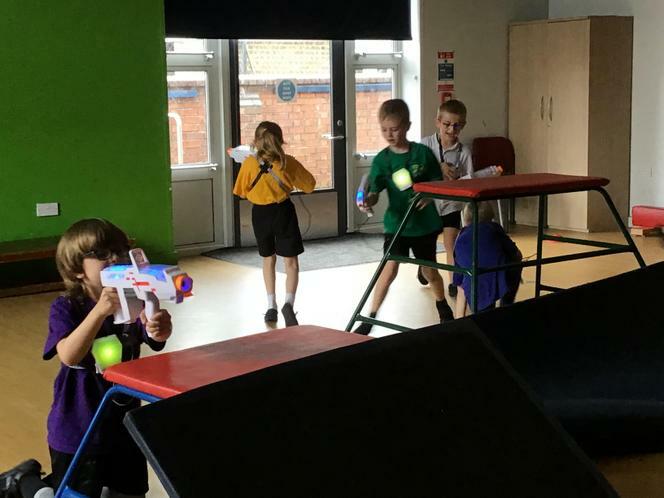 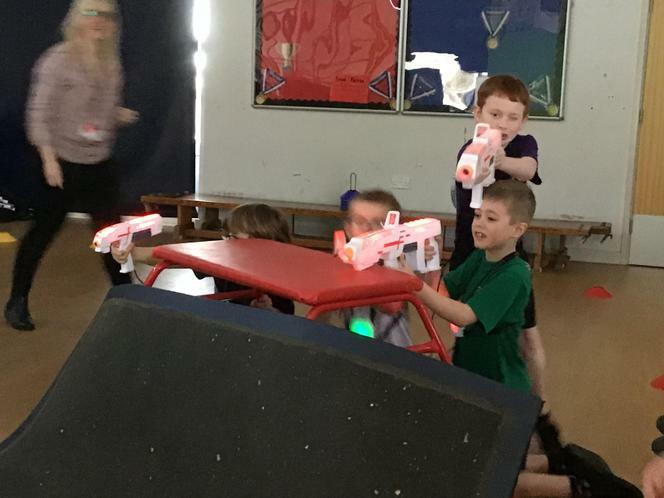 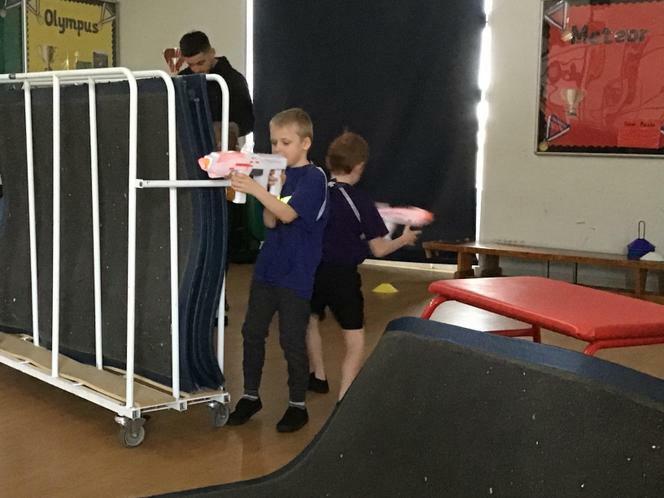 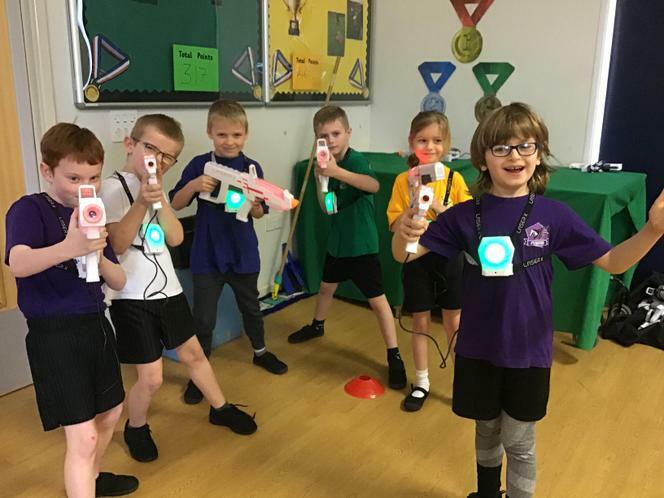 We took part in a session of laser tag today. 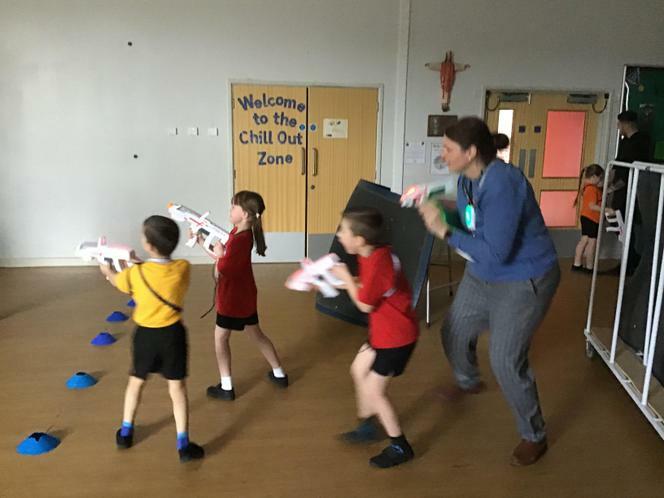 We had so much fun, even Mrs Wilkins and Mrs Seaman-Peake joined in! 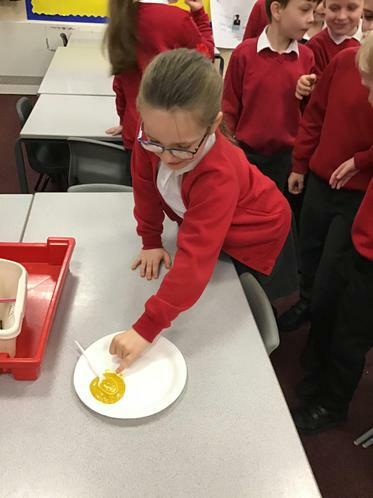 Today we took part in a science experiment alongside Class 7 from the junior school. 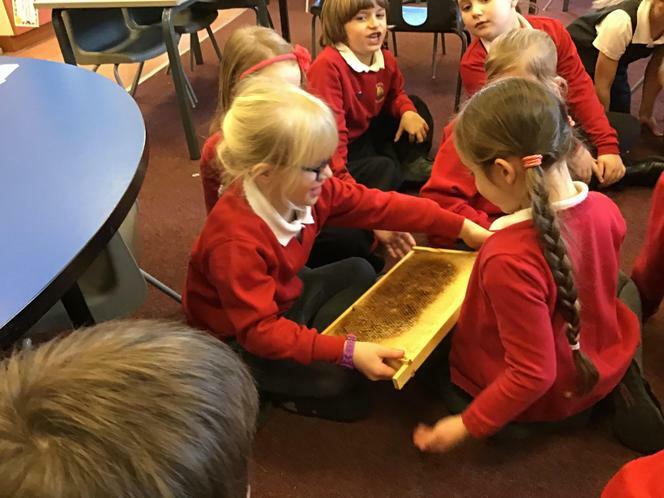 We were trying to find out if rainwater is more polluted if it’s been collected from the side of the road or in the park. 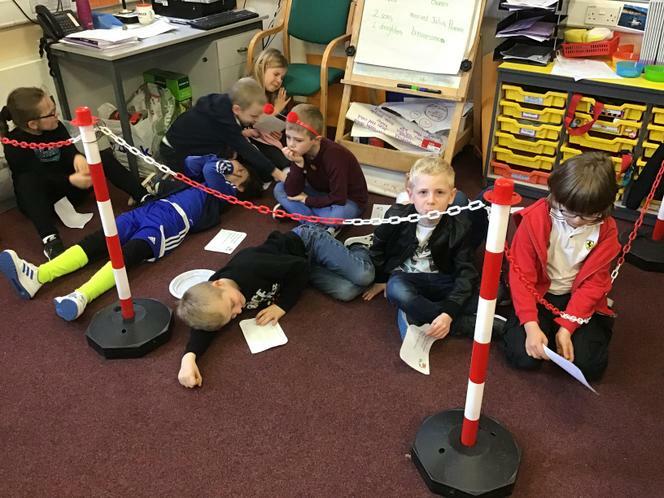 We added a reagent to the water and waited for a reaction and discovered that the water collected from the roadside was more polluted due to the pollution from the vehicles that use the roads. 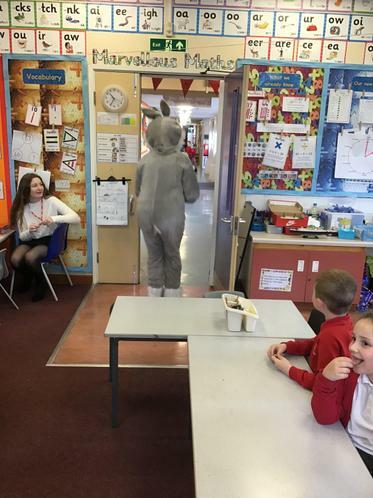 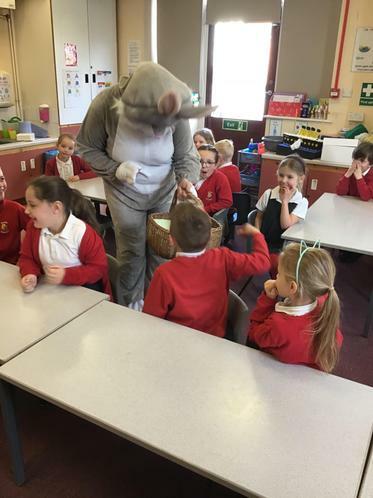 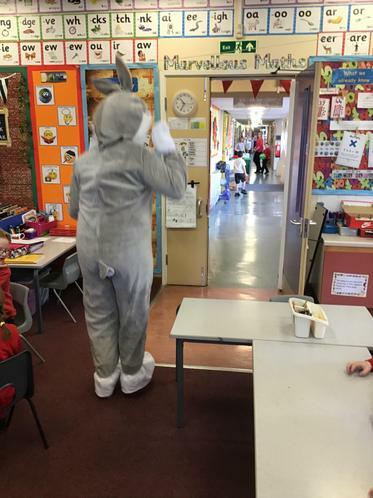 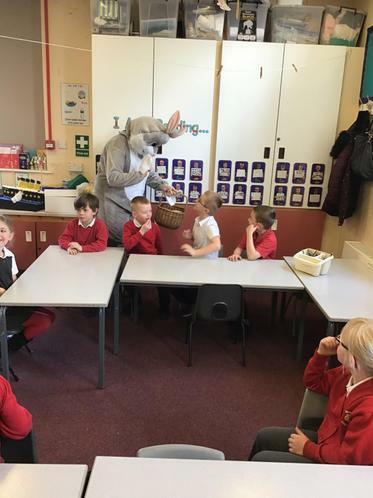 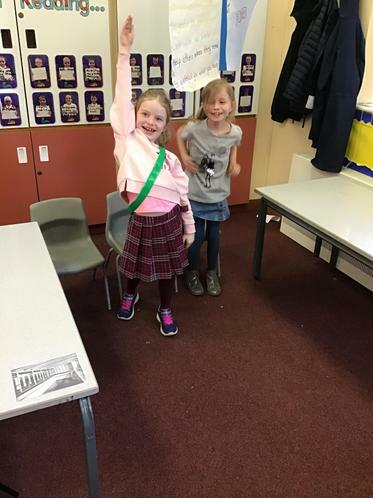 Today we celebrated World Book Day by coming to school dressed as our favourite book character. 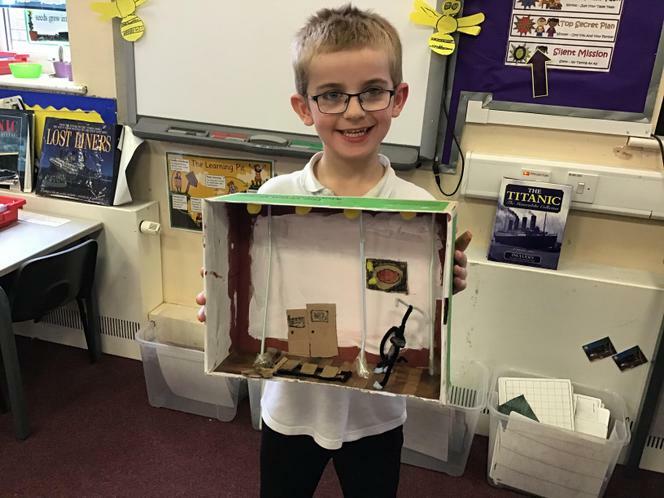 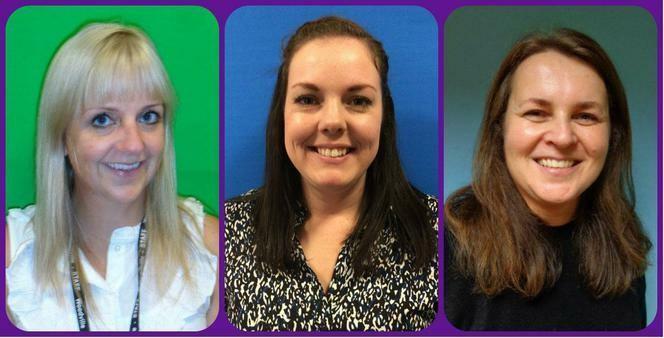 We had a Horrid Henry, several Harry Potters, a Goldilocks and even a Greatest Showman to name but a few. 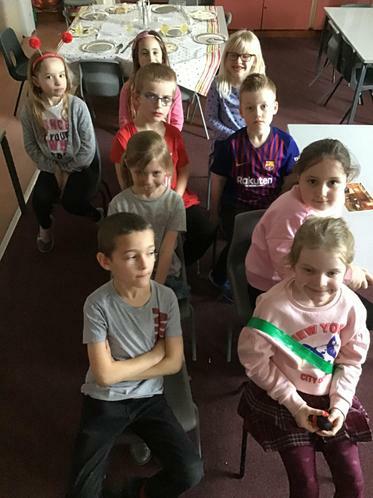 We all looked fabulous. 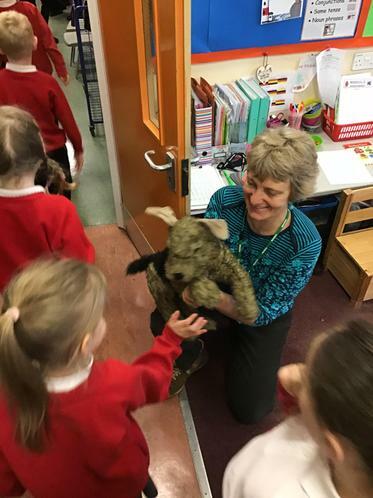 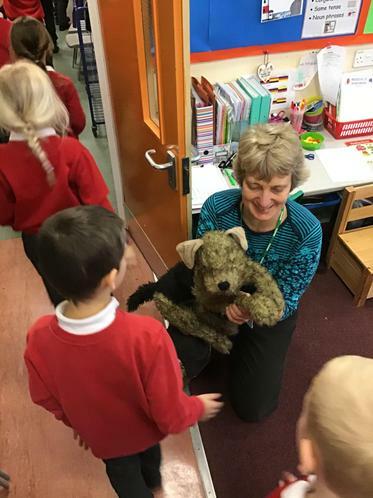 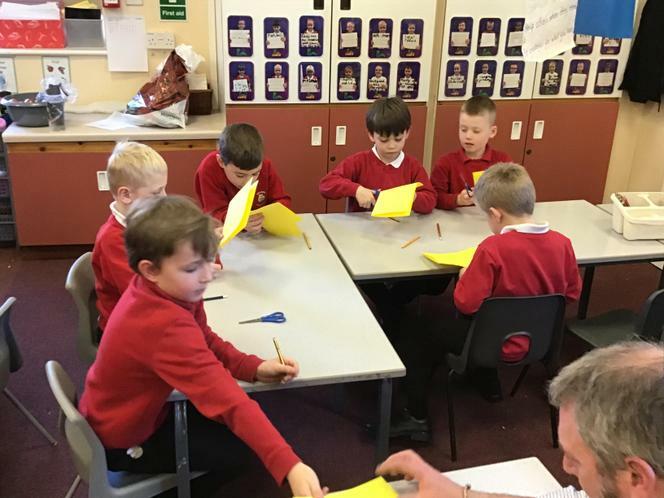 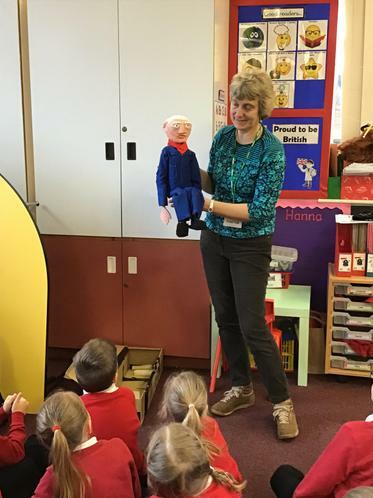 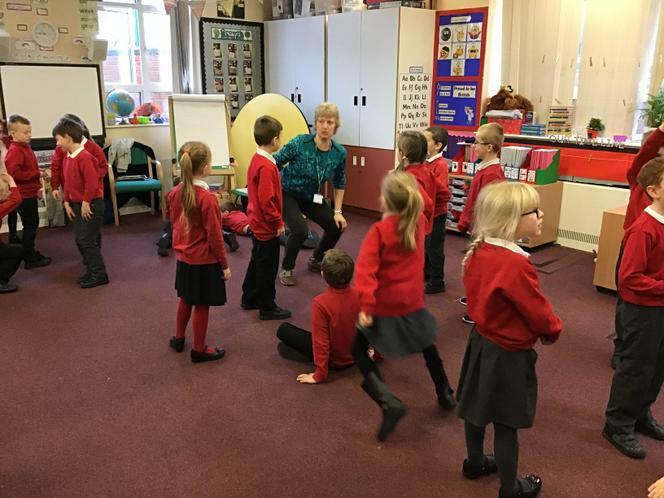 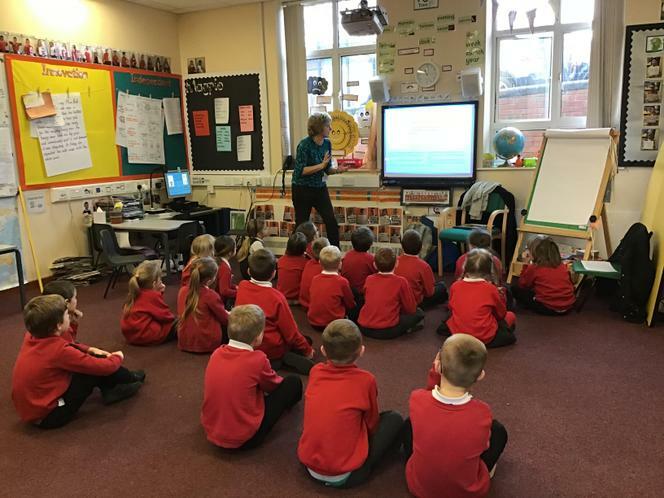 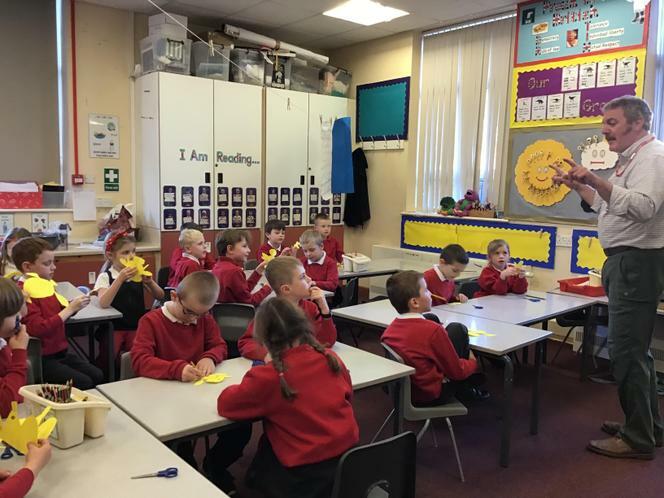 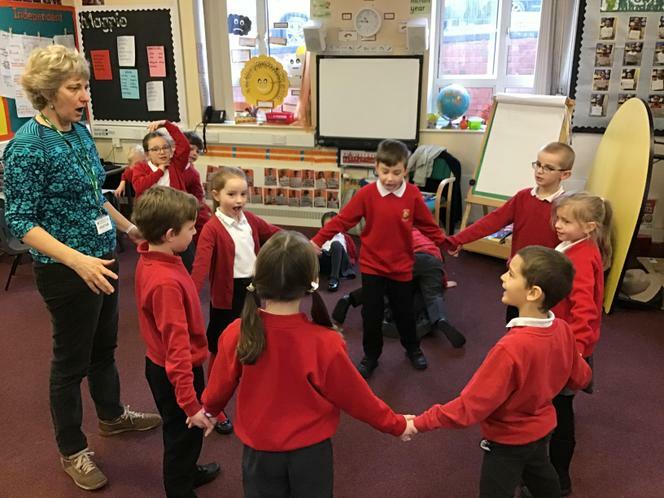 We took part in an author workshop with Rachel Greaves author of Ruffle the Rail dog books. 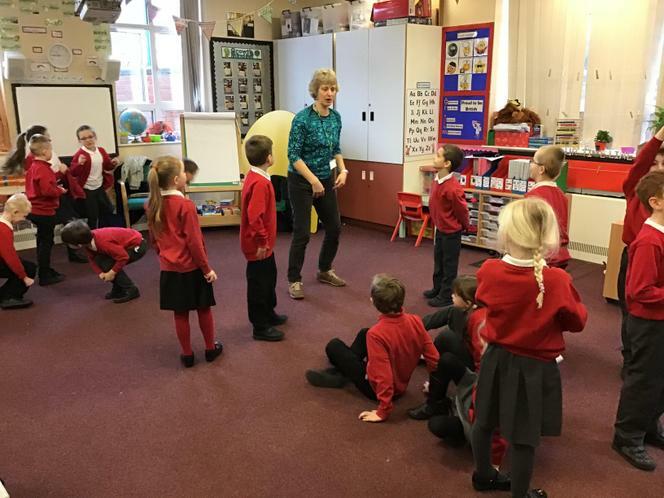 She inspired us as writers and we acted out one of her stories thinking about exciting language we could use to describe things in her story. 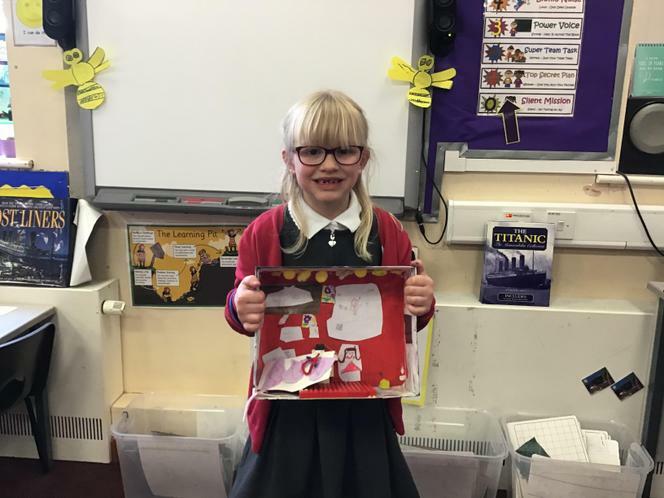 We had lots of fun and we were really inspired. 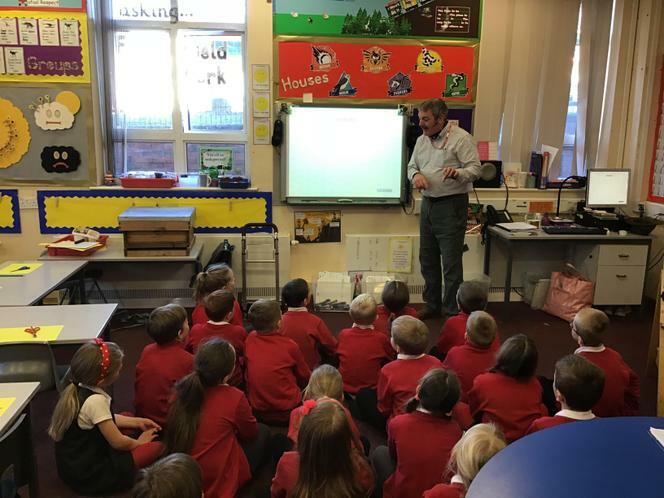 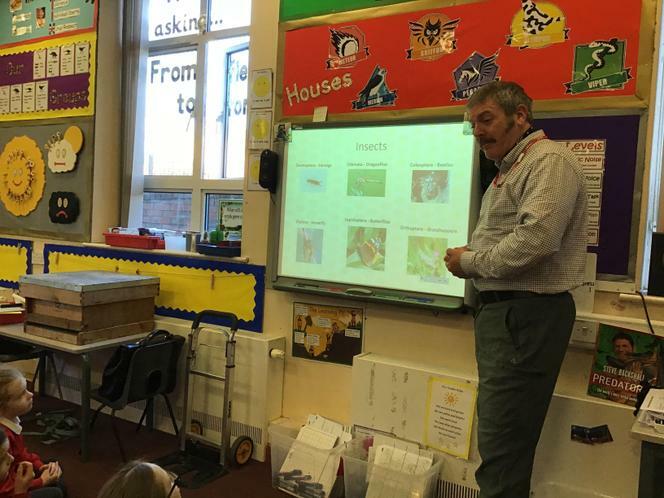 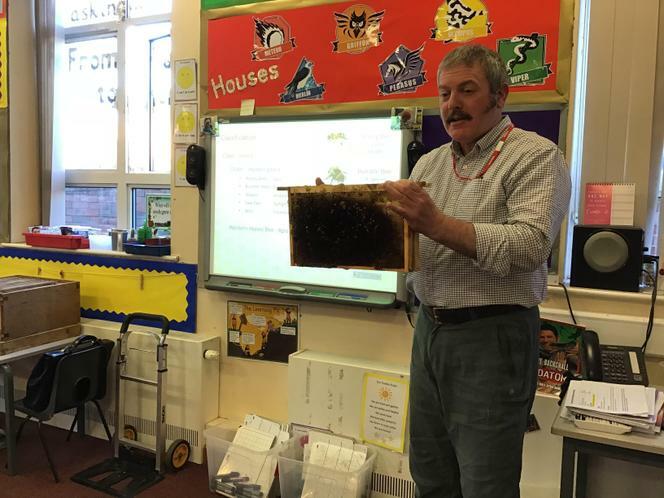 Today we had a visit from Dave the bee farmer who came to talk to us all about bees and the anatomy of bees. 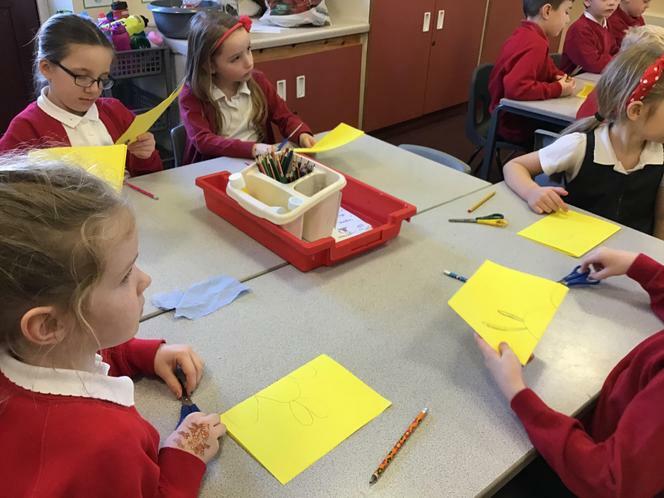 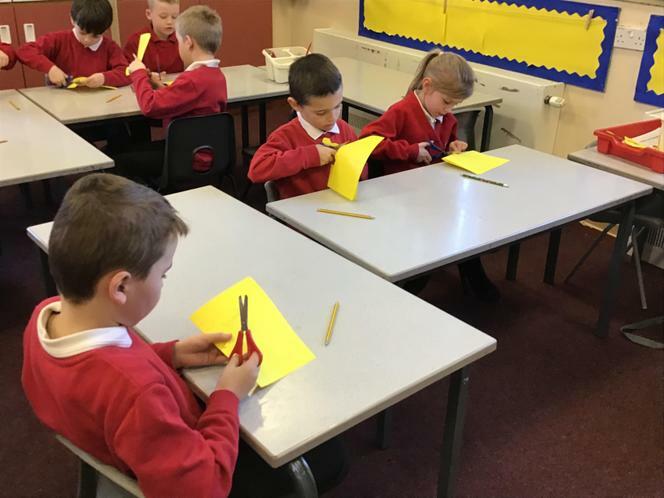 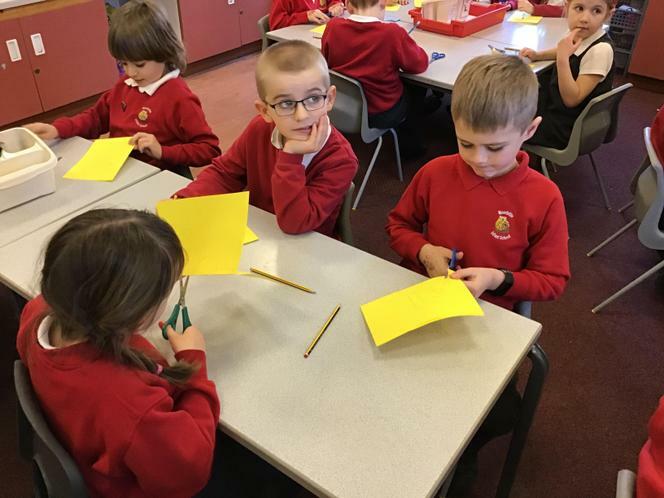 We learnt lots of interesting facts and we even made our own bee! 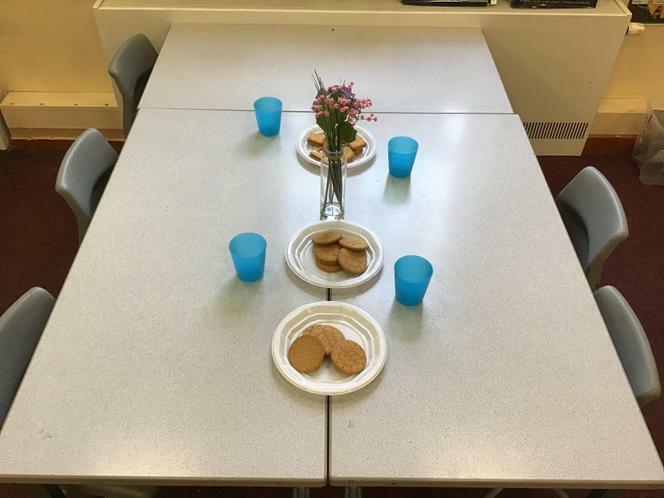 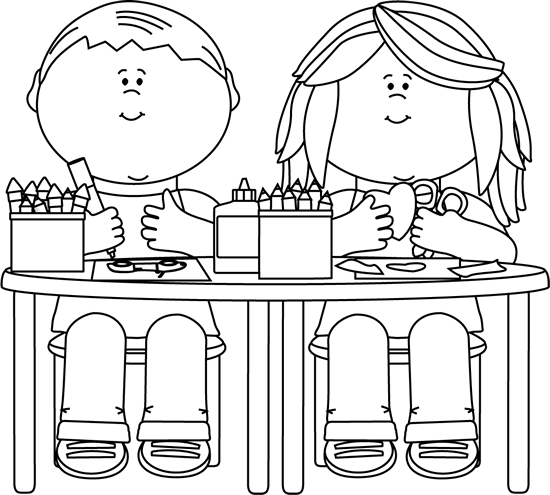 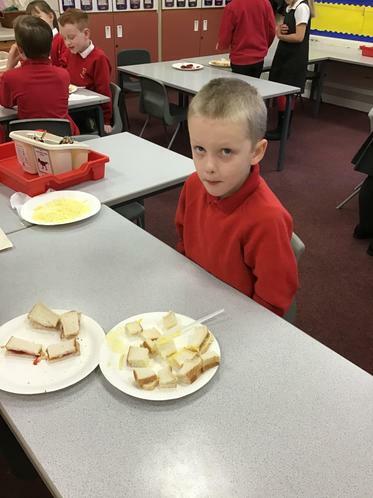 On the first day back after the holidays we shared the story of the Lighthouse Keeper's Lunch. 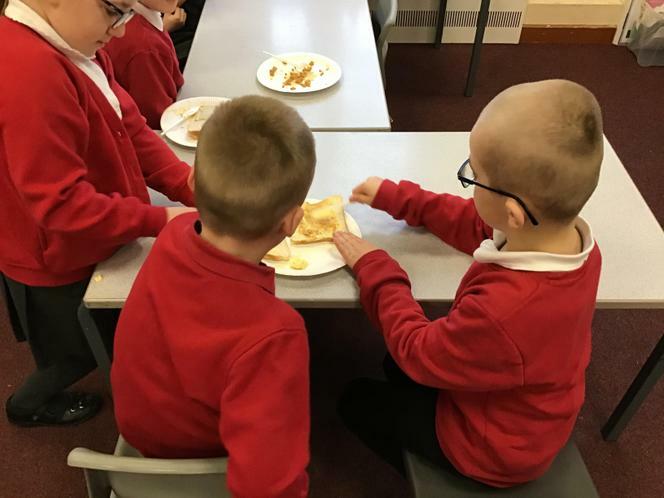 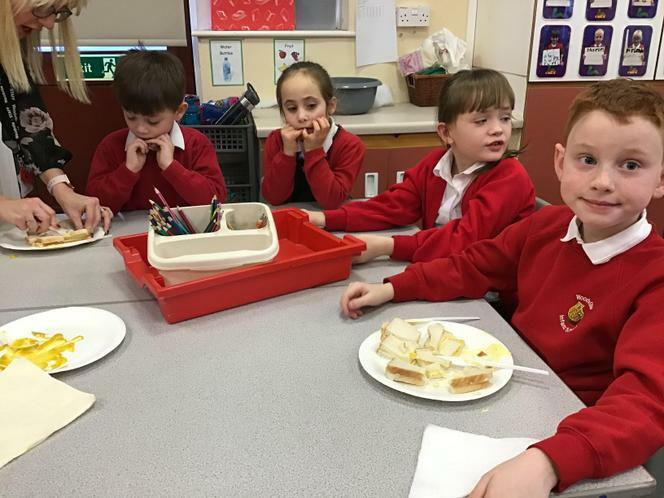 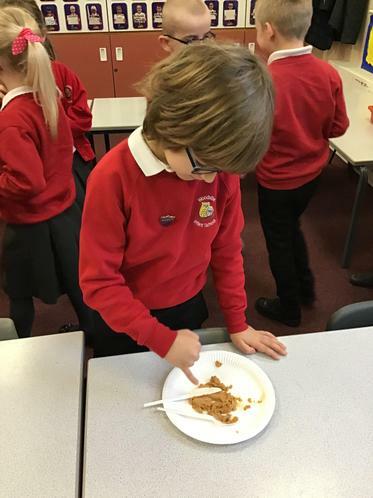 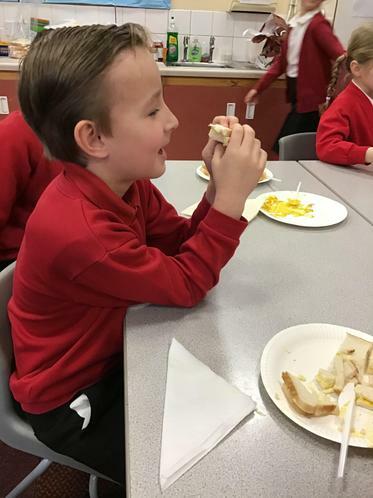 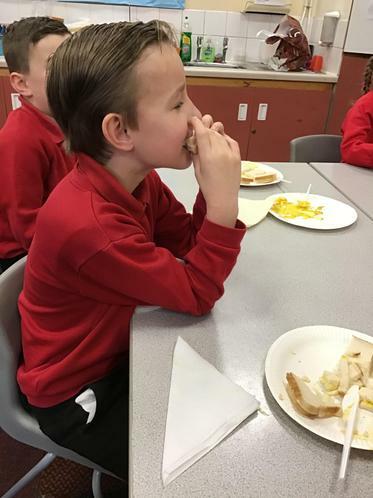 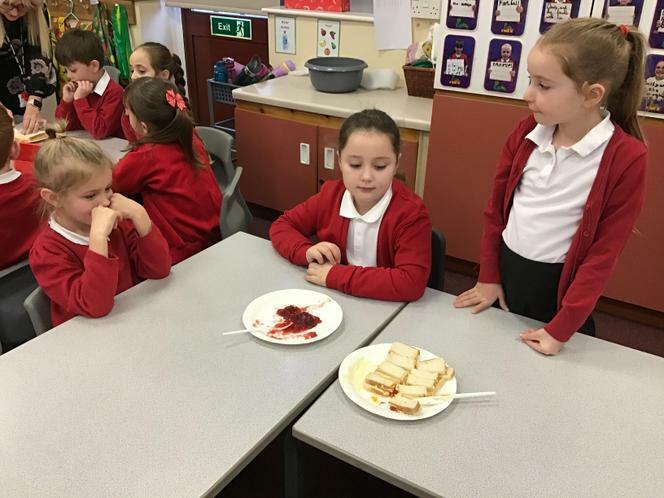 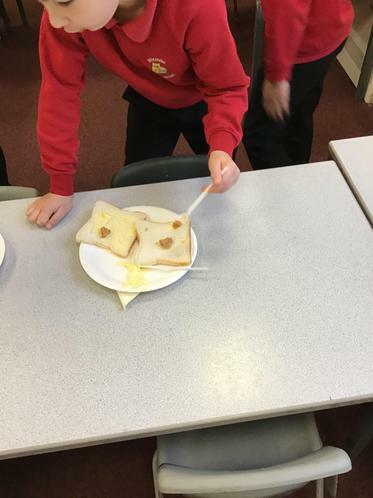 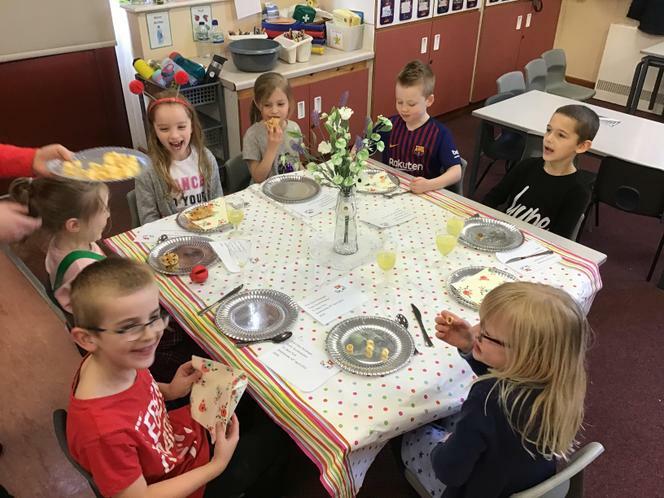 Following on from this we made and tasted our very own disgusting sandwiches, just like Mrs Grinling does in the story. 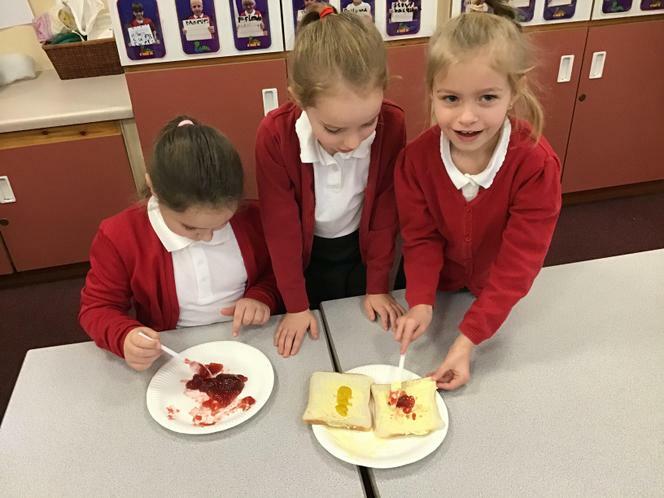 We used fish paste, mustard, jam or cheese. 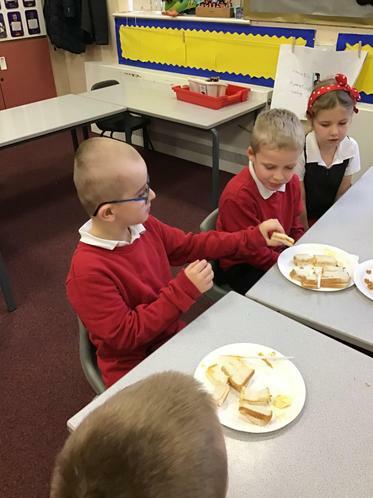 Some of them were actually quite tasty!